Remember the very first commandment of old house renovation? Thou shalt not destroy good old work. More than 35% of the garbage at America’s landfills is construction-related waste. That’s a phenomenal amount of debris. What’s worse is this: The replacement materials promoted at contemporary big box stores (in most cases) has a serviceable life of less than 10 years. So that new light gray bathroom with white accents will probably need replacing, and THOSE construction materials will also end up at the city dump. We have got to stop destroying “good old work” in older homes in the name of keeping up with the Joneses (and the Kardashians). You know what makes my blood boil? Ads like this. 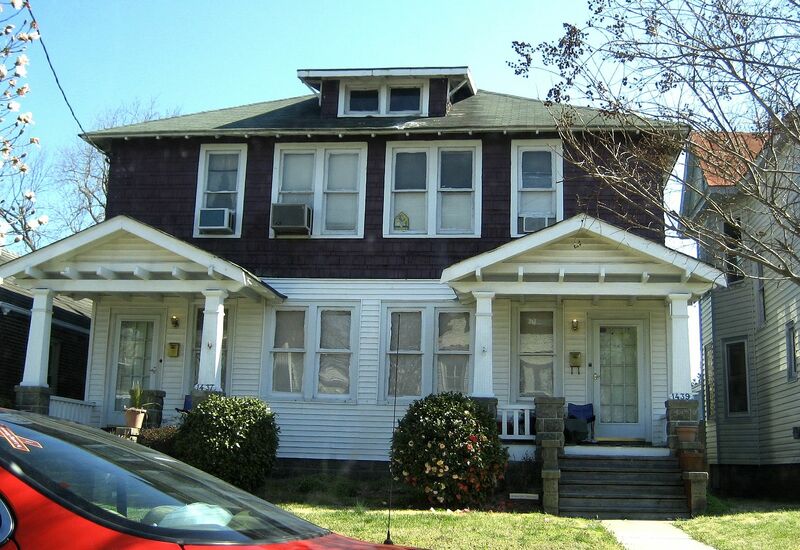 NOTE: All the houses shown below are in Portsmouth, Virginia. There's a special extra-toasty place in preservation hell for this bank. A very special place. 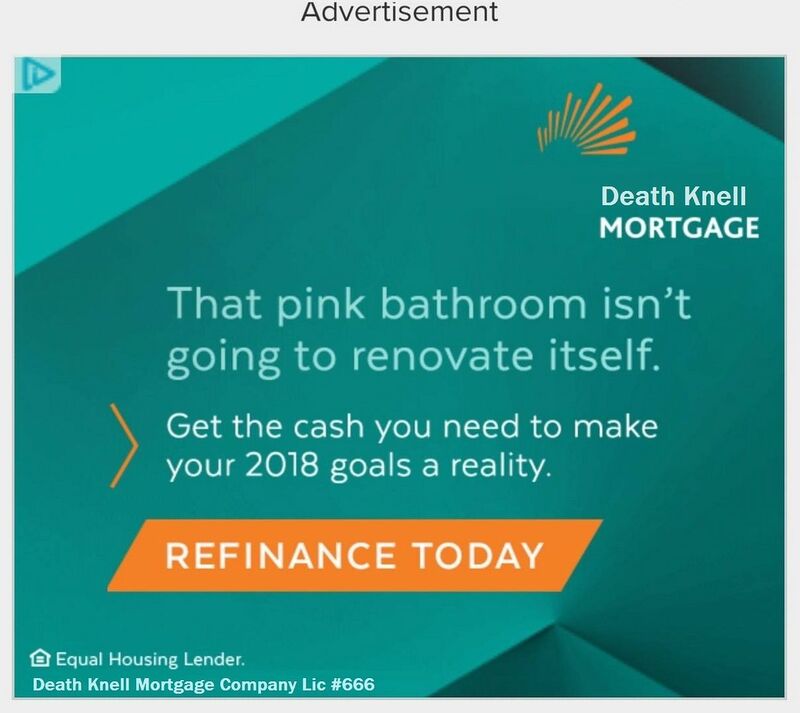 A friend sent me this advertisement. It popped up on her Facebook page. Oh, how I loathe this promotion. It feeds into the insanity promoted by HGTV that "old and lovely" is never good enough. And yet odds are that this same bank will spearhead efforts to promote recycling. Not much sense in saving 21 pounds of plastic and yet promoting the destruction of thousands of pounds of "good old work." 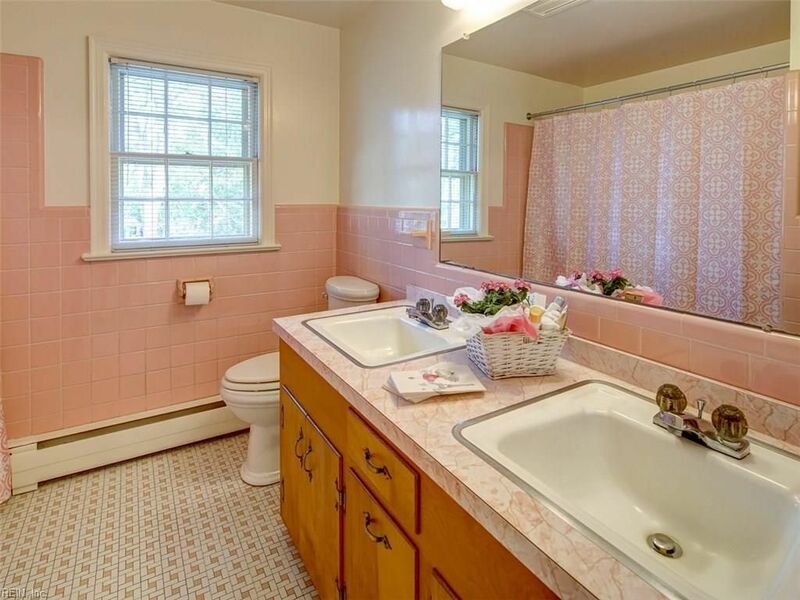 This light-pink bathroom features classic good looks and will provide decades of service. The tile floor (cartwheel pattern) is already more than 60 years old, and is set in about 6 inches of concrete. With minimal care, this floor will endure another several decades. The same is true for the tile walls. 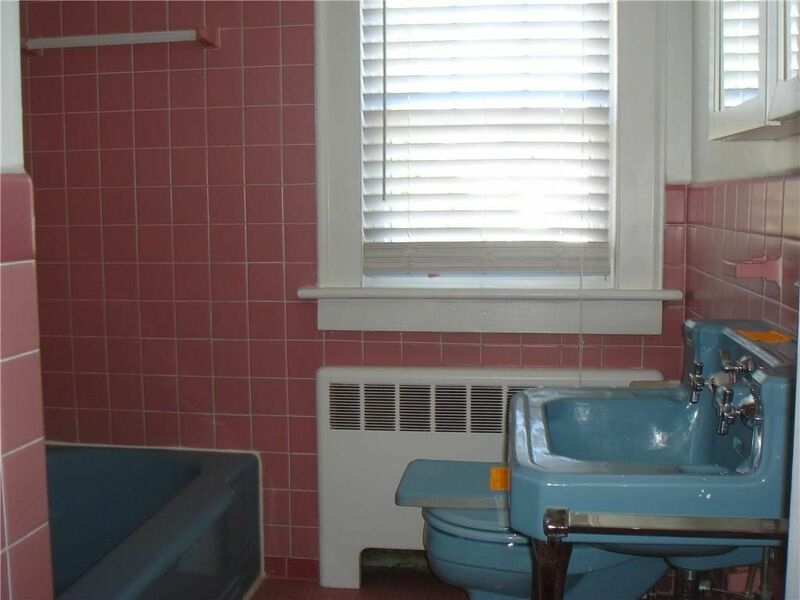 The pink tile in this Portsmouth home (Virginia) dates to the mid-1950s, and yet - due to good care and maintenance - it is in like-new condition. The materials used in these mid-century bathrooms will last another 50 years. And yet their modern replacements - fiberglass and plastic junk from big-box stores - will not endure. 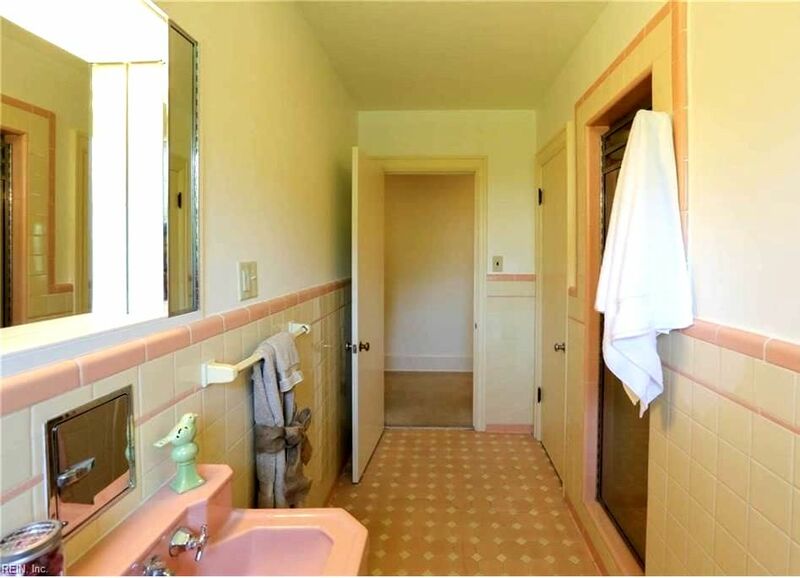 When I was a kid growing up in Waterview (a 1920s/30s middle-class neighborhood), I don't remember seeing anyone "remodel" their bathrooms, and yet by the 1960s/70s, these kitchens and baths were quite old. 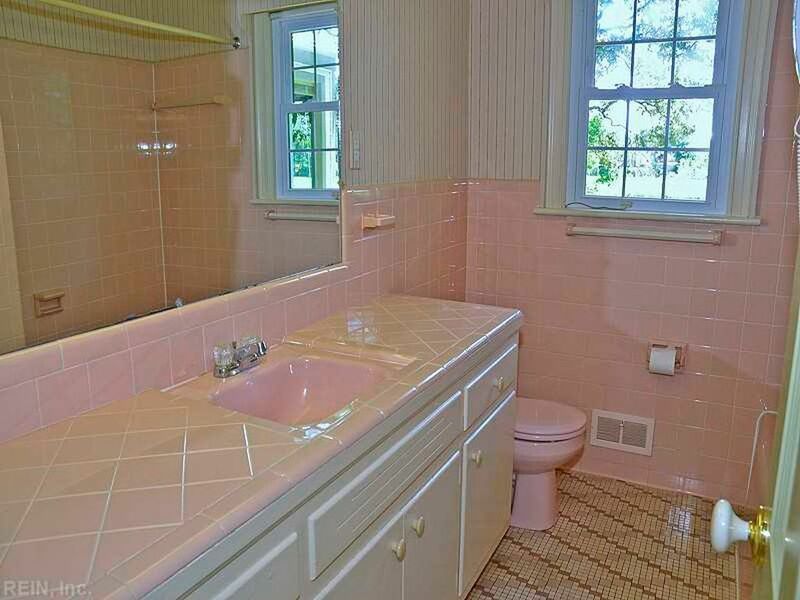 The pink bathroom featured here has its original sink and toilet. As with the others, it will endure for many more years. The same bathroom (shown above) from a different angle. It has a tiled shower and separate tub. It's also beautiful, with the white and pink tile. 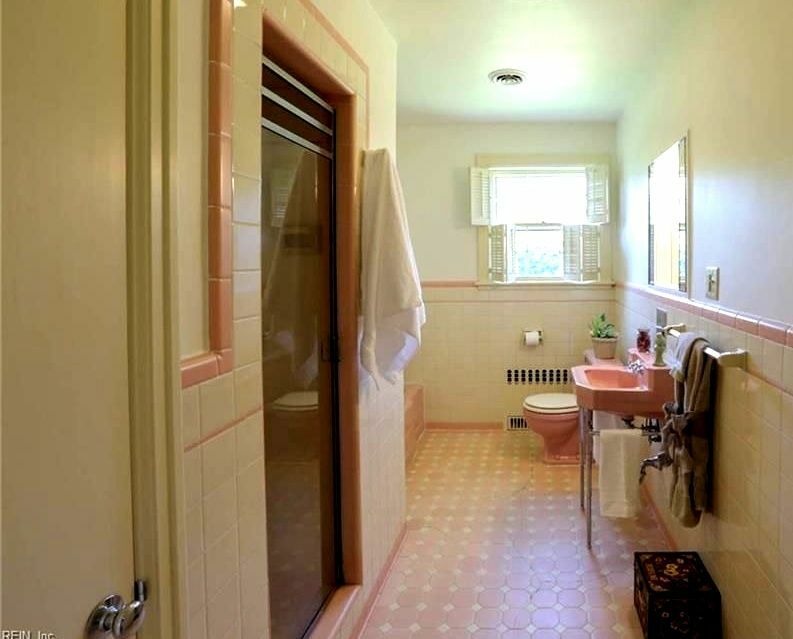 Some pink bathrooms are more subdued than others, but these mid-century tile jobs are typically set in several inches of concrete. When experts recommend retreating to a bathroom during a tornado, this is the type of "safe space" they have in mind. The thick-set mortar bed plus copper pipes plus additional wooden framing makes this one sturdy space. 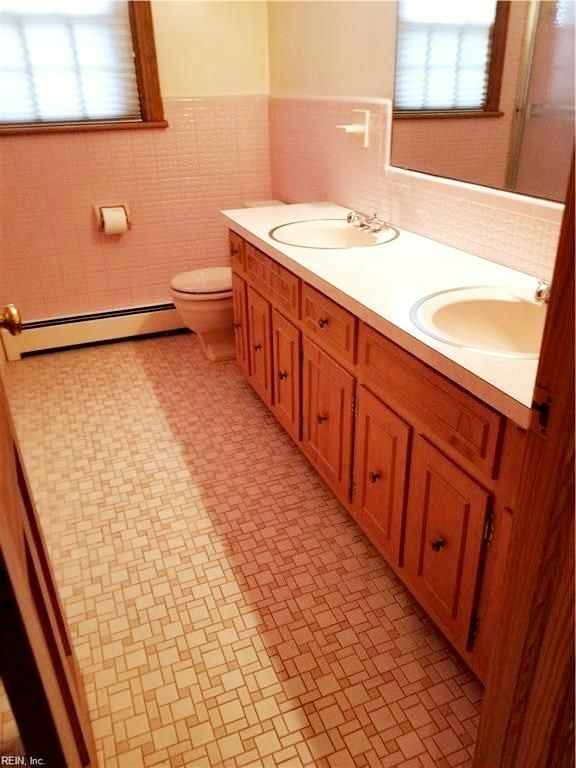 My favorite pink bathroom is a deep rose with blue accents. I tried to purchase this house (in Waterview) late last year, but it got tangled up in a bidding war, and the price went from $210,000 to almost $270,000 within hours. 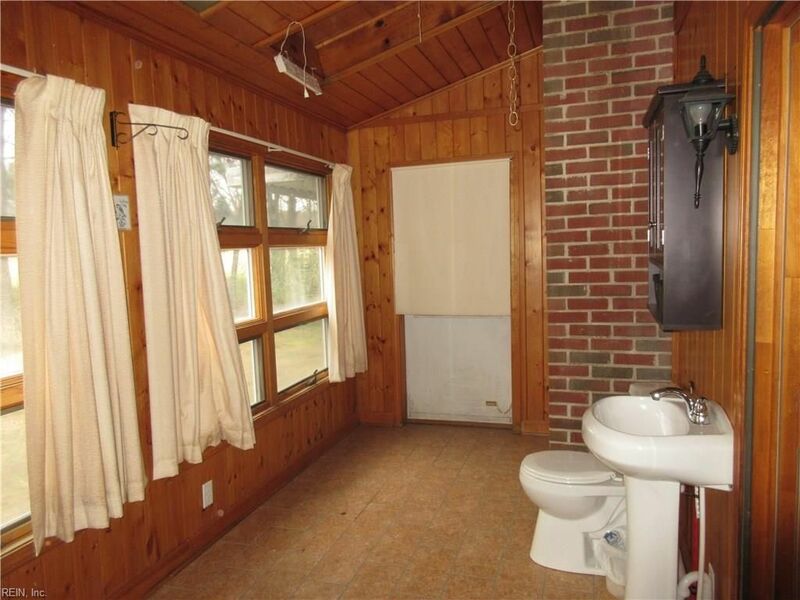 It was probably this bathroom that drove up the price. We have got to stop destroying “good old work.” My current home has a green bathroom. Green is my least favorite color, but I have decided to live with it for a time and see how I feel about in 5 years or so. It may grow on me. I do know this: Society needs to learn that “keeping up with the Joneses” is a path to madness, waste and financial foolishness. NOTE: All the houses shown above are in Portsmouth, Virginia. Anyone familiar with the movie “Back to The Future” will recognize that refrain. It was 30 years ago that I first saw that movie, and yet even then, I bonded instantly with that delightful character. Somewhere deep inside my heart, I knew I was glimpsing my very own future. As regular readers of this blog will know, I’m a native of Portsmouth, Virginia. I grew up admiring the architecture of this historic port city in Southeastern Virginia. 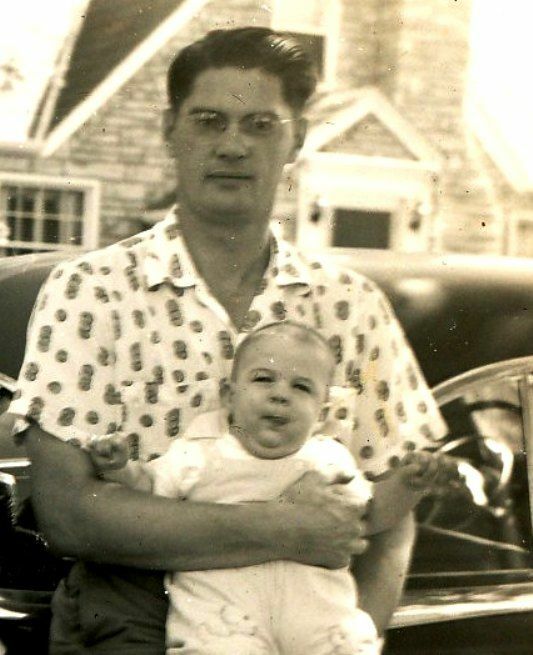 When I was a little girl, my father would drive me around downtown Portsmouth and I’d study the architecture. One of the most impressive images of the landscape was the Confederate Monument at High and Court Street. 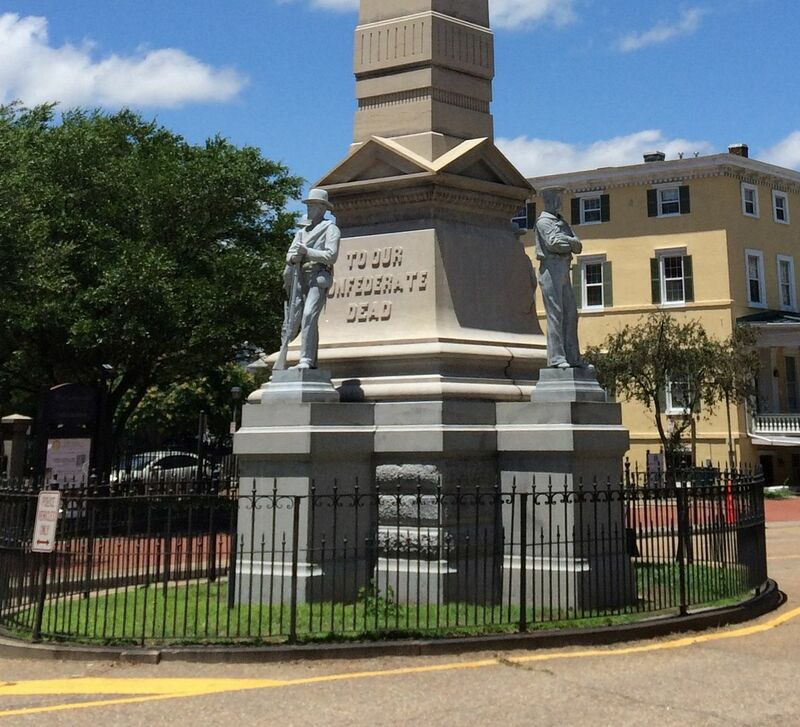 This monument has been an icon in Portsmouth for more than 130 years, and now Portsmouth’s city council is seriously considering taking it down. 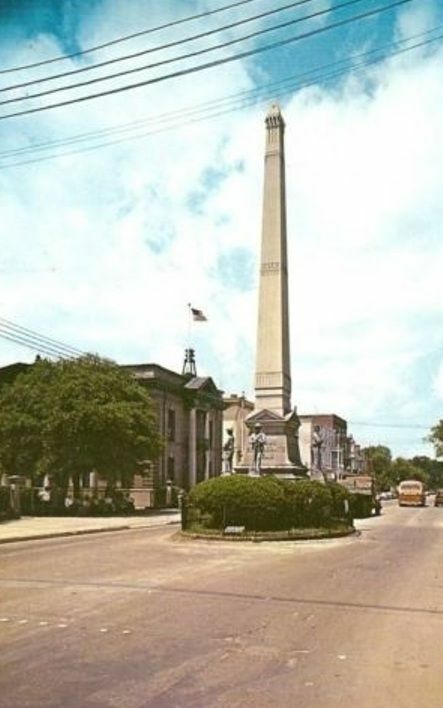 Construction on the 55-foot tall obelisk was started in 1876, after the horrors of Reconstruction had loosened their grip on Portsmouth, Virginia. After the war, Portsmouth was broken and bankrupt, with more than $300,000 in debt. In today’s dollars, that’s $4.3 million. Eleven years after the Civil War ended, the Ladies of the Confederacy - women who had lost everything in this war - banded together and created the Portsmouth and Norfolk County Monumental Association, with the hopes of erecting a memorial to their sons, their fathers, and their husbands. It took more than 11 years for the people of Portsmouth to raise the money to finish the statue. 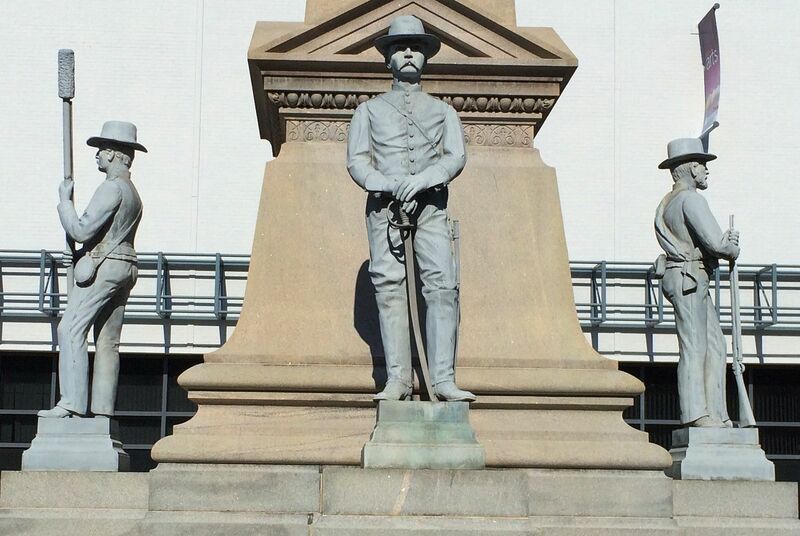 It’s one of only three statues in the South that feature all four branches of service. When the Civil War began, Portsmouth had 900 registered voters, and yet more than 1,200 soldiers were mustered from Portsmouth. Of those 1,242 soldiers, 199 died in the war. Many of the war dead were buried where they fell. Others were left in the fields to rot. Some were laid to rest in mass graves, or unmarked graves, far from their home in Portsmouth, their names forgotten in time. This monument is a grave marker for those men who were never given a proper burial. 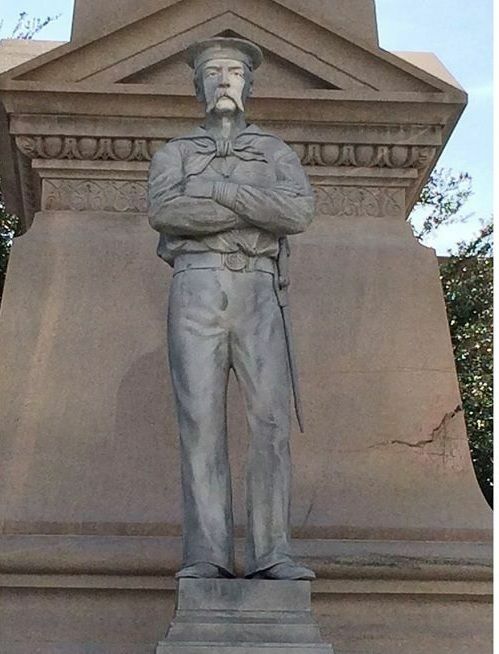 To read about the Northern view of our Confederate monuments, click here. 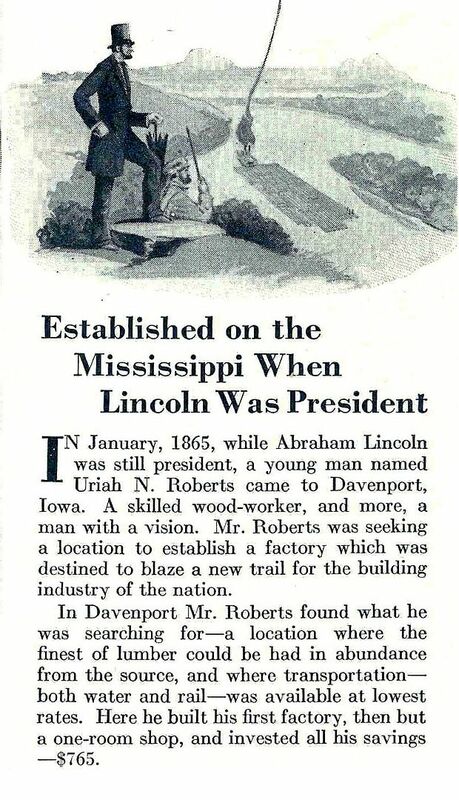 If you’re interested in donating money to help in the legal fight to save this 139-year-old monument, please click on this tab or the “Tip Jar” tab at the top of this page. All paypal funds received into that account within the next 60 days will go directly to Stonewall Camp #380, to help defray their legal expenses. If you’re interested in learning more about this remarkable and rare monument, scroll on down, and read the captions on the pictures below. 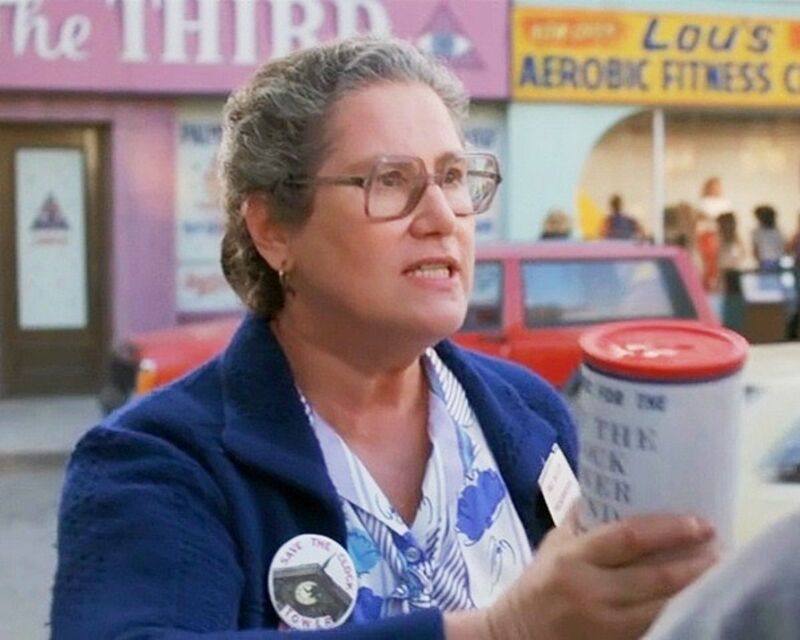 I was in my 20s when I first saw this movie, but even then I knew that one day, I'd be this woman. The infamous clock tower, as seen in "Back To The Future." 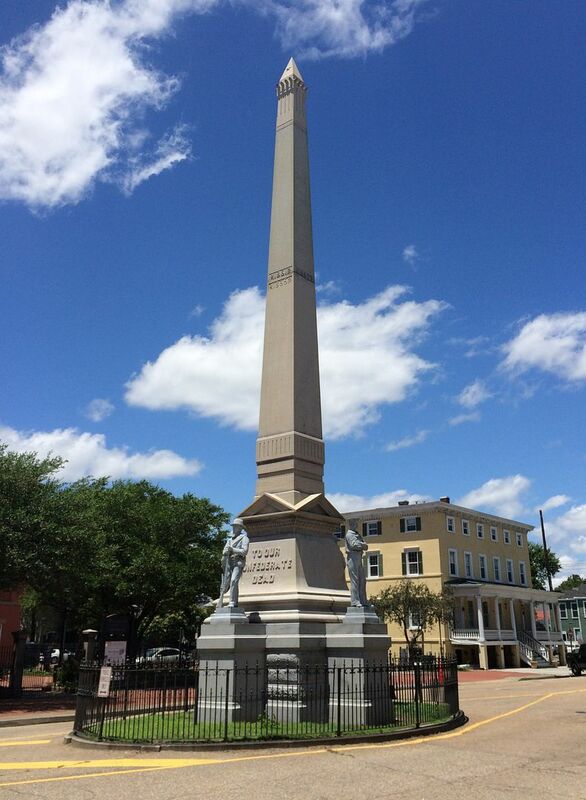 The monument in downtown Portsmouth is on the National Registry, and is considered historically significant for many reasons. For one, it's one of only three monuments in the South that feature all four branches of service. The wrought-iron fencing is original to the statue. It took 11 years for the people of Portsmouth to raise the money for this monument. When the statue was dedicated, schools and businesses were closed for the day, as the happy throngs filled the streets to celebrate its completion. The four branches of service honored on this monument are the Infantry, Navy, Cavalry and Artillery. 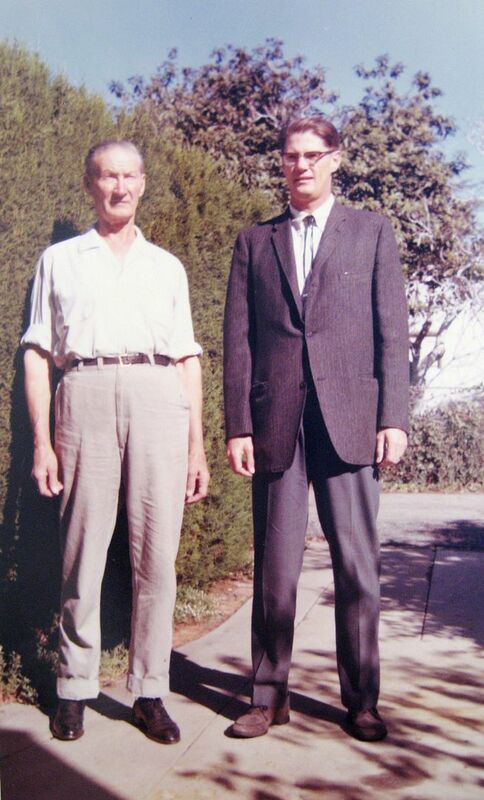 When commissioned, the zinc soldiers were to be 6'3" tall, but when they arrived, they were a mere 5'8" tall (according to contemporary newspaper accounts). After much discussion, it was decided to accept the shortened statues. According to the National Registry application for the statue, the four soldiers featured on the statue were Portsmouth men. The Artillery man was modeled after J. Shirley Hope; Frank Wonycott - Cavalry; William Henry Buchanan, a Civil War veteran was either the Cavalry representative or the Navy man. 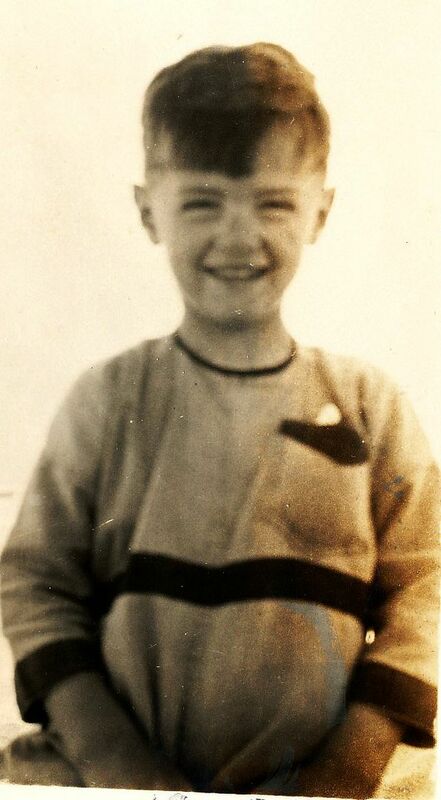 James W. Nicholson was the other model. The sailor (shown here) was my favorite fellow. One of my earliest childhood memories has been this tall statue in downtown Portsmouth. It's an important part of our history. To read more about the historical significance of this statue, click here. 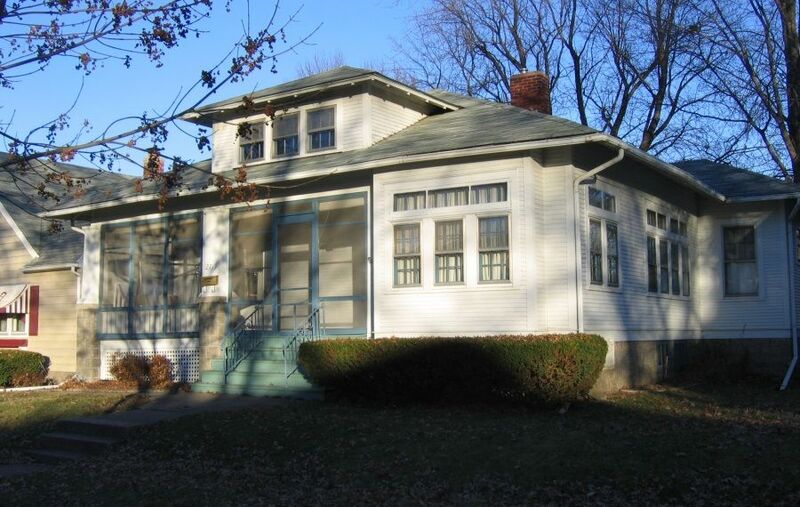 To learn more about old houses, click here. Earlier this month, I did a blog on the sweet little GVT #114 that Dale found in Manheim, Pennsylvania. After that blog appeared, Dale was kind enough to send along two more photos of GVT Modern Home #114. I’ve never seen one in real life, but apparently this was a fairly popular house! Thanks to Dale for the wonderful photos! Want to read the earlier blog on GVT #114? Click here. As seen in the 1913 catalog. I love this text: "The ultra of beauty in design." 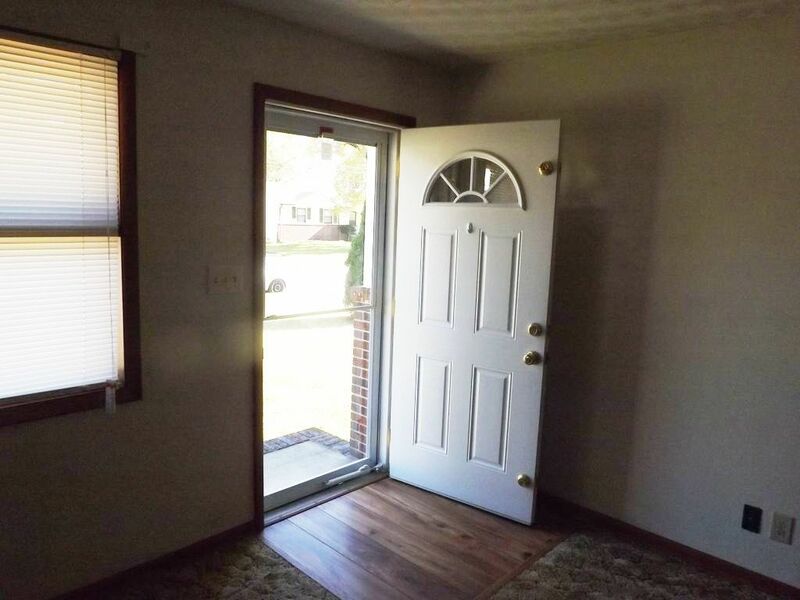 Some of these kit homes are a misery to identify, but #114 has many unique features. Here's the #114 that Dale found in Manheim, PA.
Dale found this one in Davenport, Iowa. 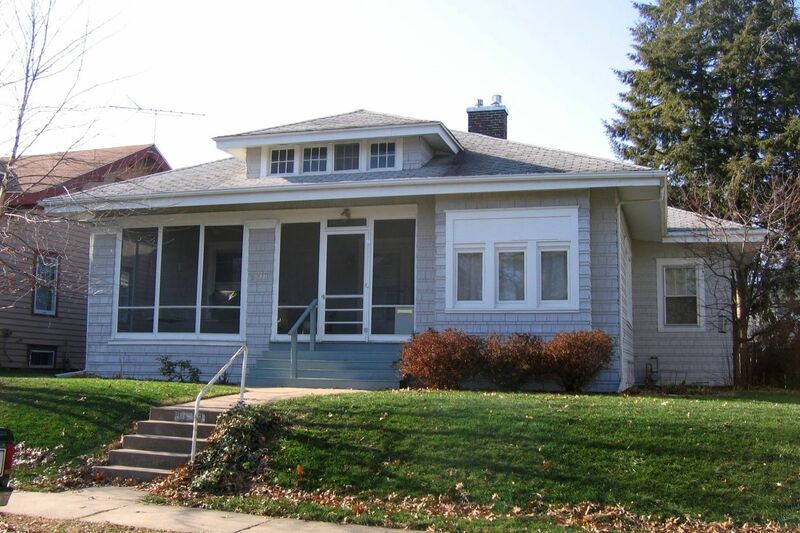 This #114 was also found in Davenport, Iowa (home of Gordon Van Tine). Want to read the earlier blog on Wardway #114? Click here. 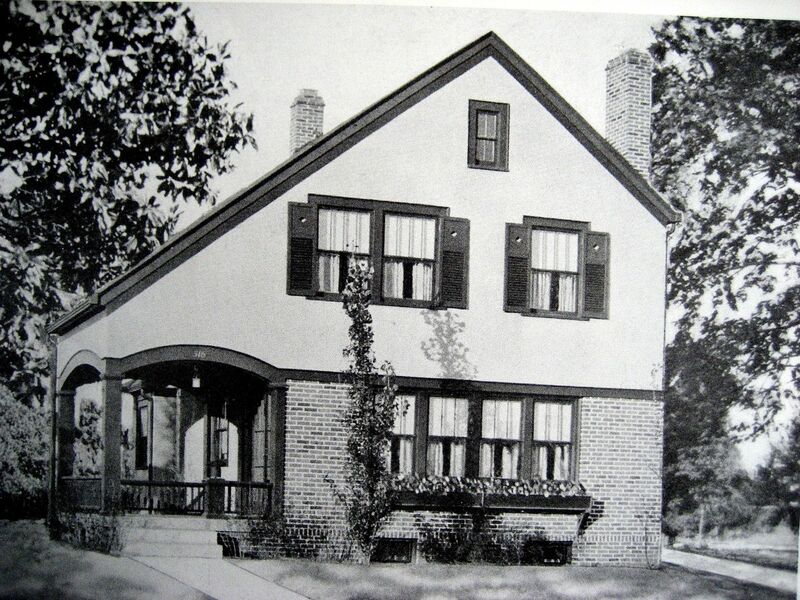 Gordon Van Tine homes are not as well known as Sears, but they were a substantial competitor in the mail-order house business. 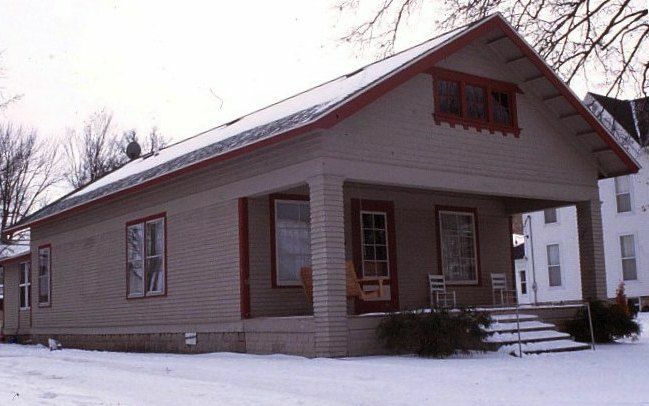 GVT was founded in 1866 (as a lumber supply company) and evolved into a mail-order house company about 1909 (according to GVT expert, Dale Wolicki). 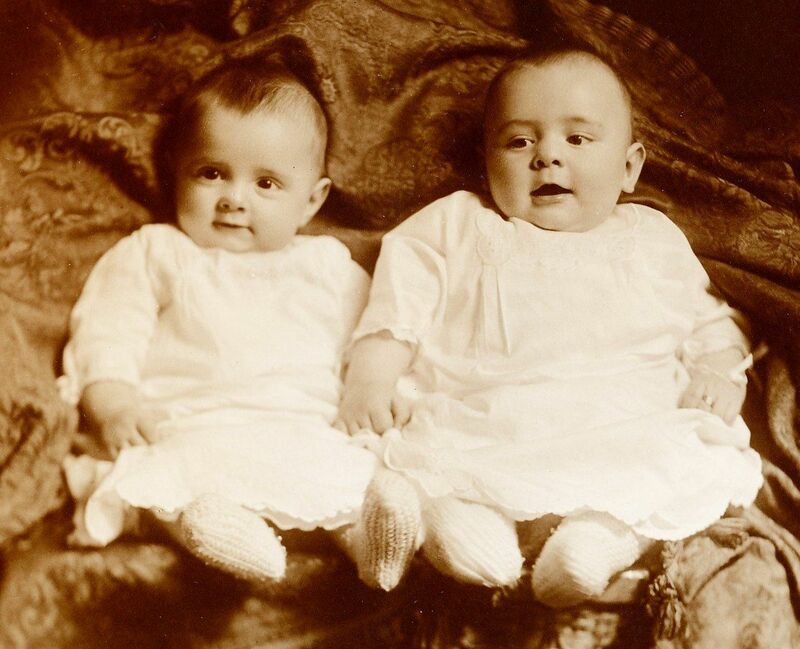 By contrast, Richard Warren Sears didn’t start selling watches until 1886! 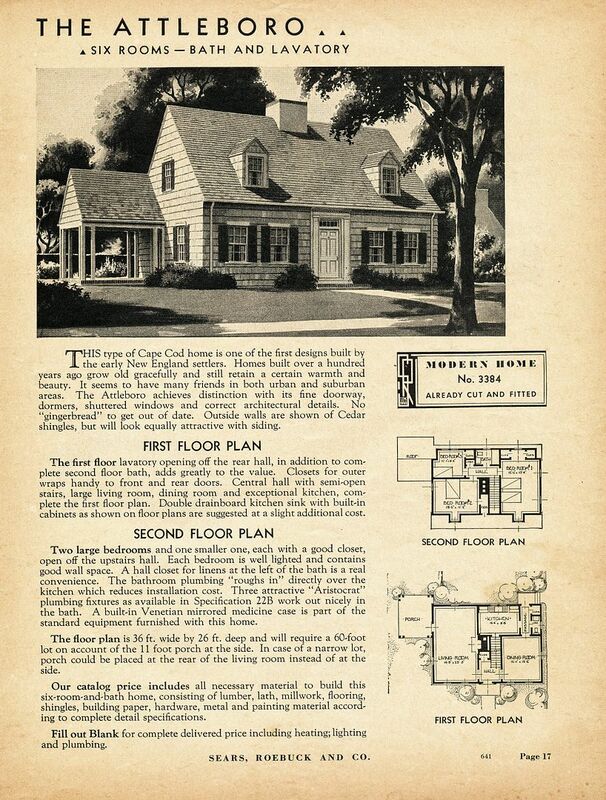 Sears issued their first building materials catalog in 1895, and their first house catalog came out in 1908. 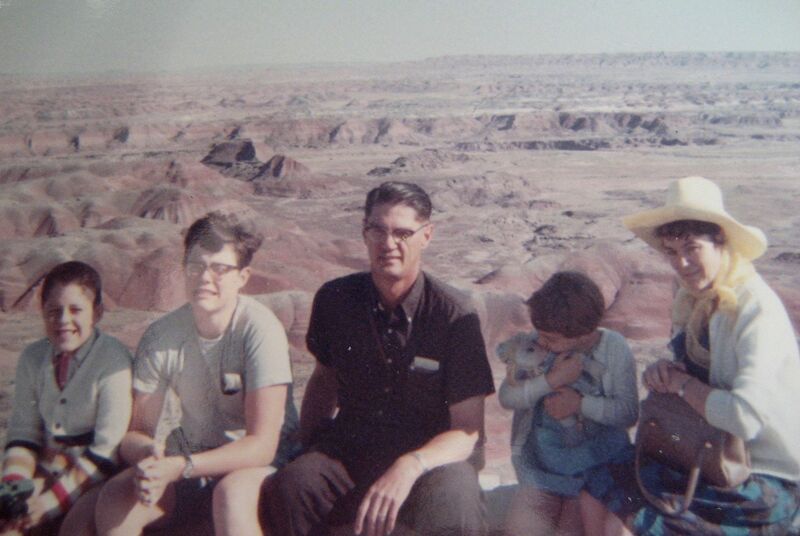 Gordon Van Tine was based in Davenport, Iowa, but they had mills in Mississippi and Washington State. 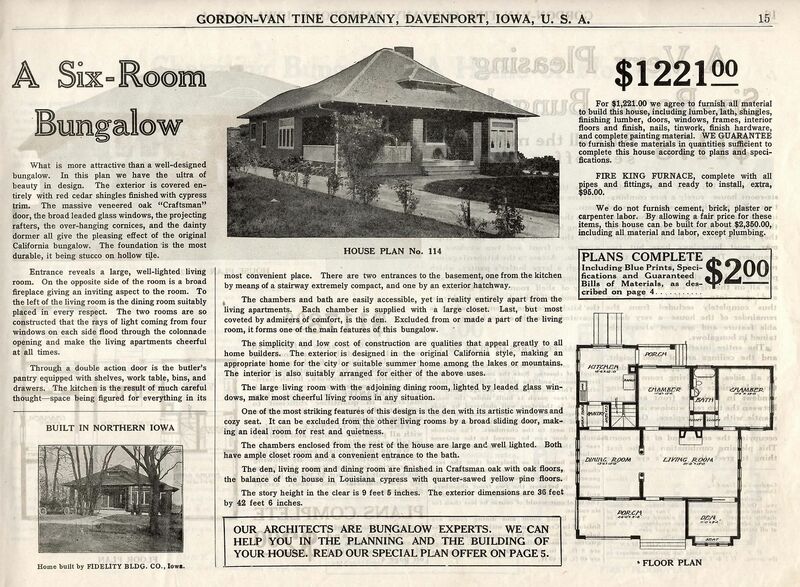 Another little interesting tidbit: Montgomery Ward also sold kit homes, but all their orders were fulfilled by Gordon Van Tine. In fact (unlike Sears), GVT handled all the details for Wardway Homes, from architectural design to catalog printing to order fulfillment. 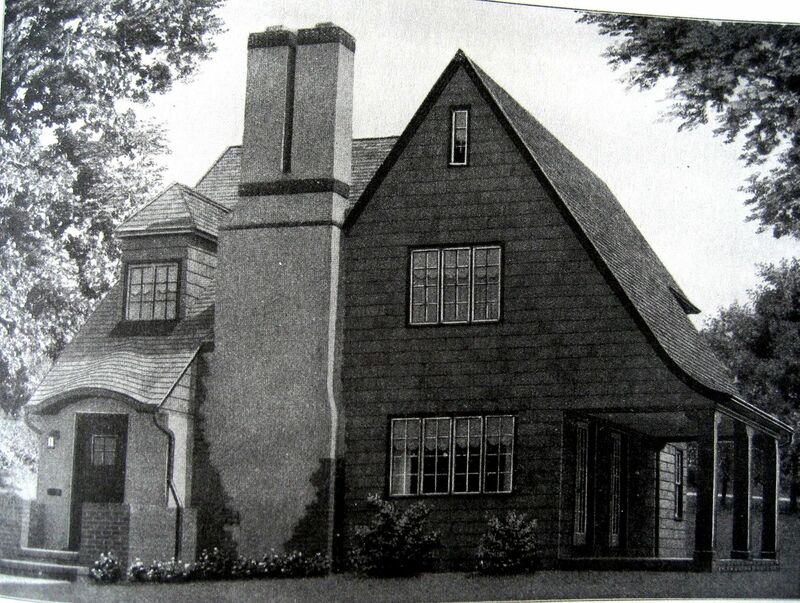 Sears hired a staff of architects to create their house designs, as did Gordon Van Tine. 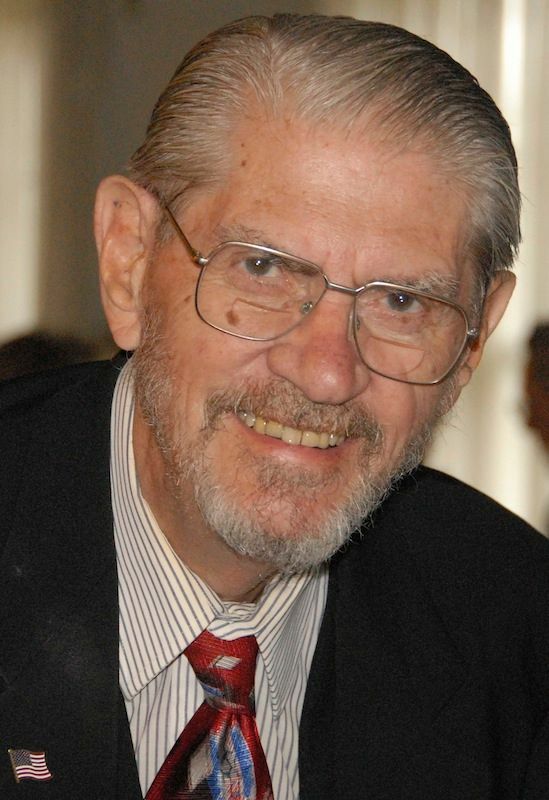 Montgomery Wards hired Gordon Van Tine! 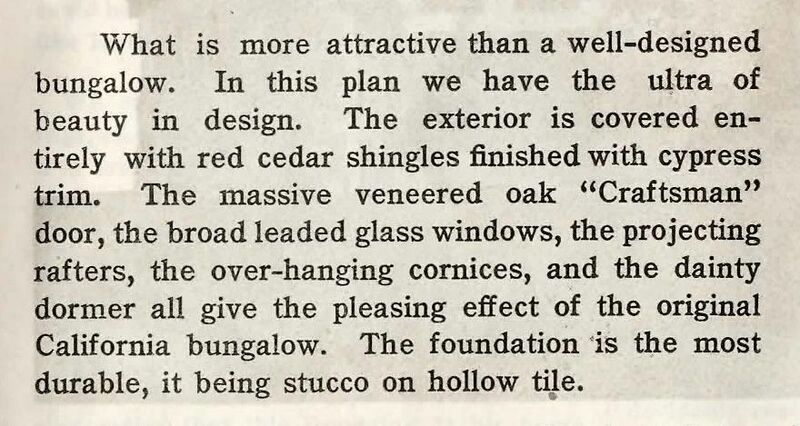 And the best part - according to the advertisement for the GVT #114, the architects at GVT were “bungalow experts”! Several years ago, Dale sent me this picture of a GVT #114, which he found in Pennsylvania. It wasn’t until I started studying the very early GVT catalogs, that I actually placed the model that Dale had discovered. 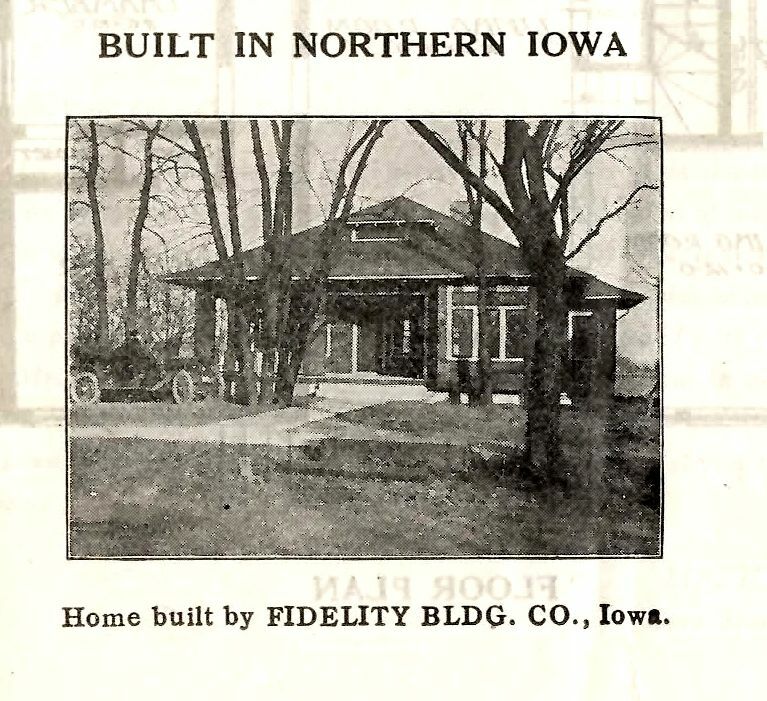 We know that there were at least two of these houses built (testimonial shows one in Iowa), but it’d be fun to know if there are more than two! Thanks to Rachel Shoemaker for scanning the 1913 and 1916 GVT catalog! And thanks to Dale for sharing his photos! This graphic (1913) explains why kit homes were typically located within 1-2 miles of railroad tracks. The logistics of moving a house from here to there typically involved a vehicle with 1-2 horsepower (as shown above). Model #114 as seen in the 1913 GVT catalog. 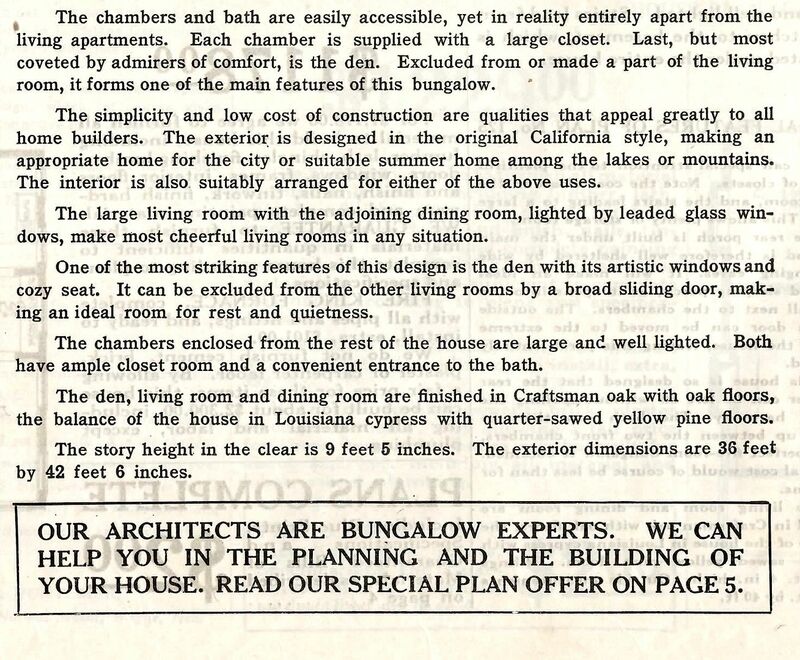 I love this part: "Our architects are bungalow experts." Were they also foursquare experts? Colonial experts? Neo-tudor experts? Or just devout "bungalow experts"? Intriguing little house, isn't it? 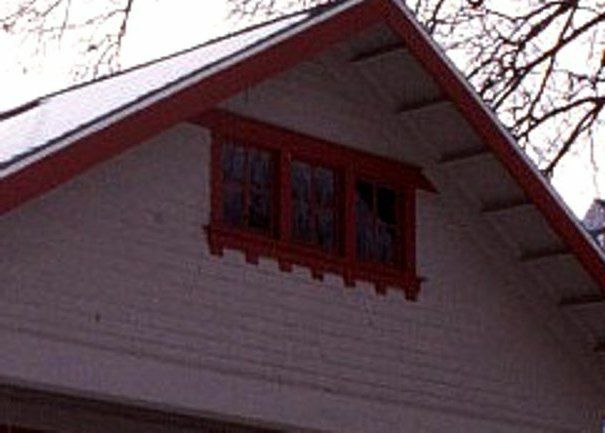 Notice the windows on the side and front, with the diamond muntins in the horizontal window that traverse the smaller windows. Nice feature, and makes it easier to identify. 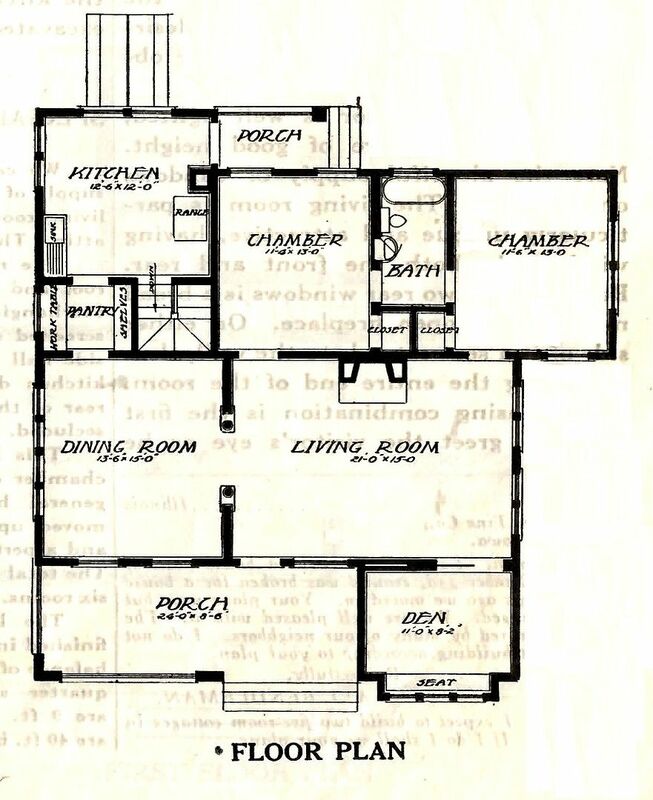 Only two bedrooms (as designed) with a small den on the front of the house. 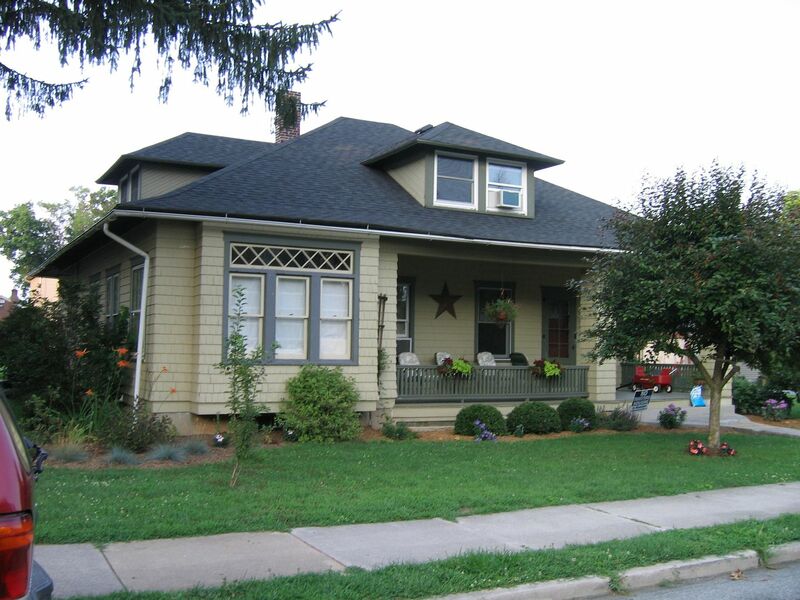 And here it is in Manheim, Pennsylvania on North Hazel Street. The dormers have been enlarged, perhaps to create better light and livable space on the second floor. The house has had some other modifications, but the question is, were these changes done when the house was built? I think that's the most likely scenario. 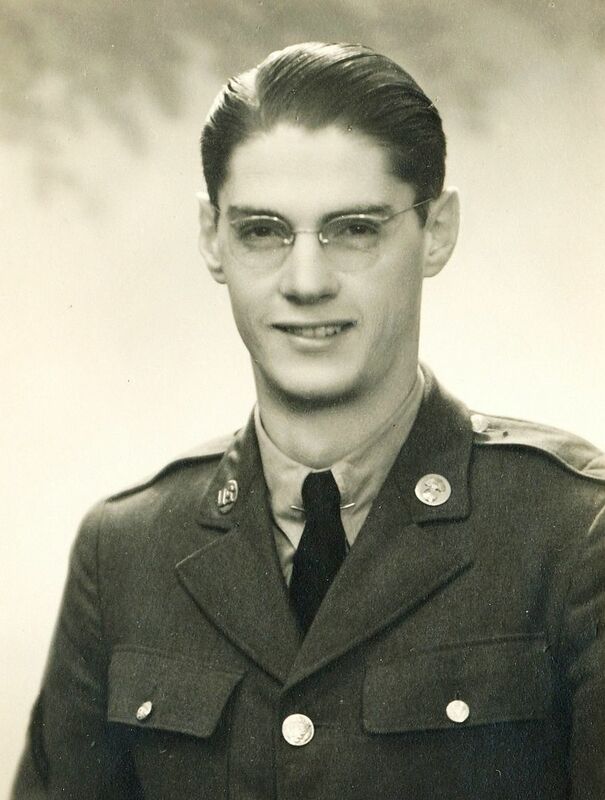 Picture is copyright 2009, Dale Patrick Wolicki and may not be used or reproduced without written permission. If you look at the house from a side street, you can see that unusual window on the side. And there's another GVT #114 in Iowa! 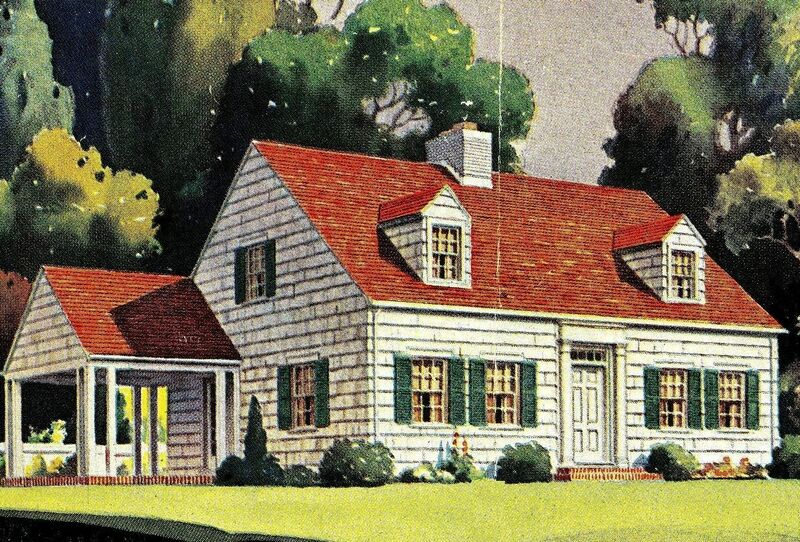 Post-1930s Sears kit homes are hard to find. Sales of the 12,000-piece, do-it-yourself kits plummeted in the early years after the Great Depression. 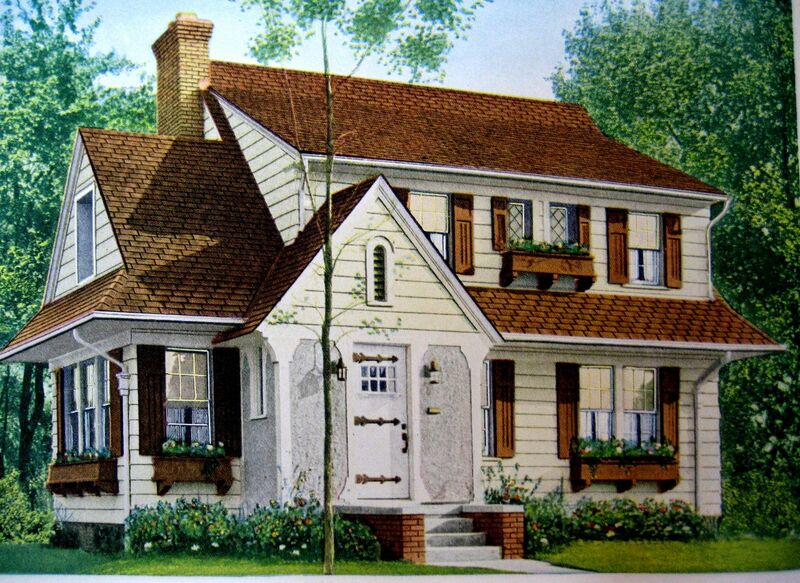 But one of the most popular post-depression kit homes is the Sears Attleboro. Several years ago, when I did a survey of kit homes for the city of Portsmouth, I was delighted and surprised to find the Sears Attleboro in the Shea Terrace section of Portsmouth. It’s in beautiful condition, and the owners have done a fine job of keeping it maintained. 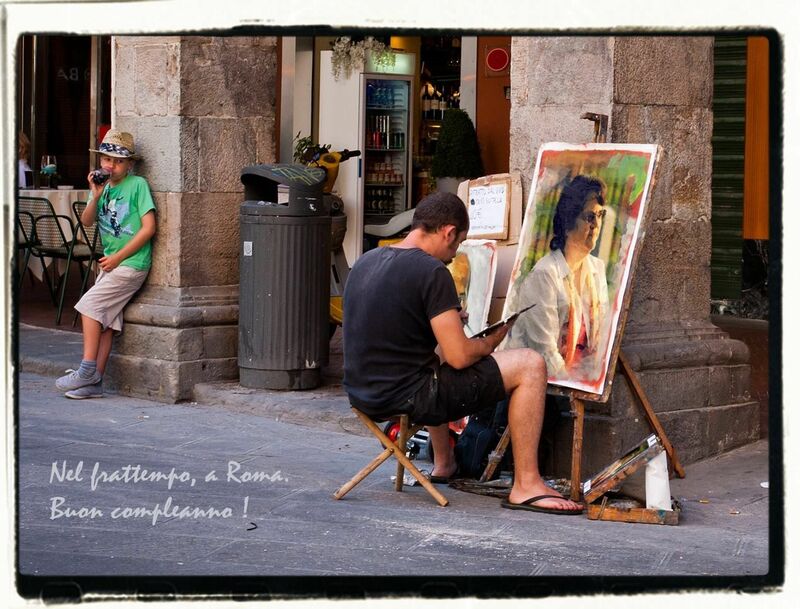 I wonder if they realize what a treasure they have! 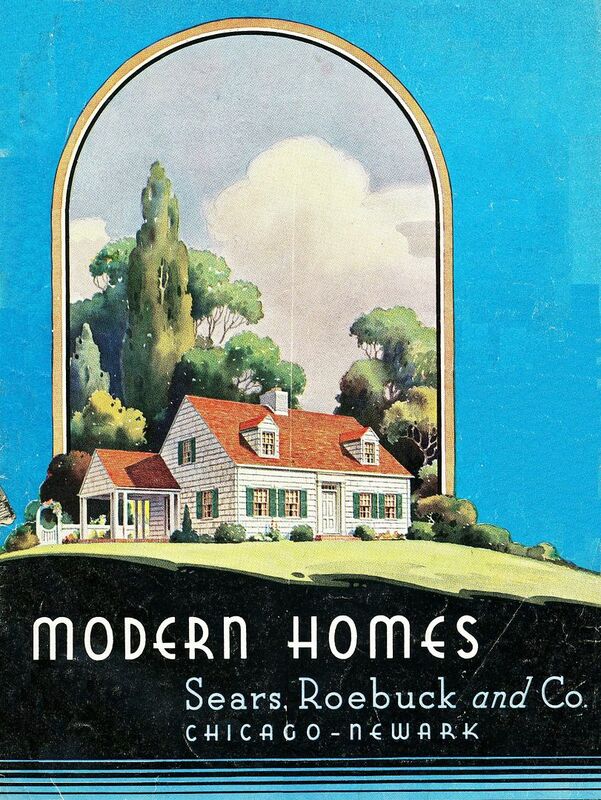 The Sears Attleboro was on the cover of the 1938 catalog. And what a fine little house it was! If you read the fine print, you'll see that the screened-in porch could be built on the *back* of the house, instead of the side. That side porch was offset a bit from the house. Notice the three small columns in each corner. 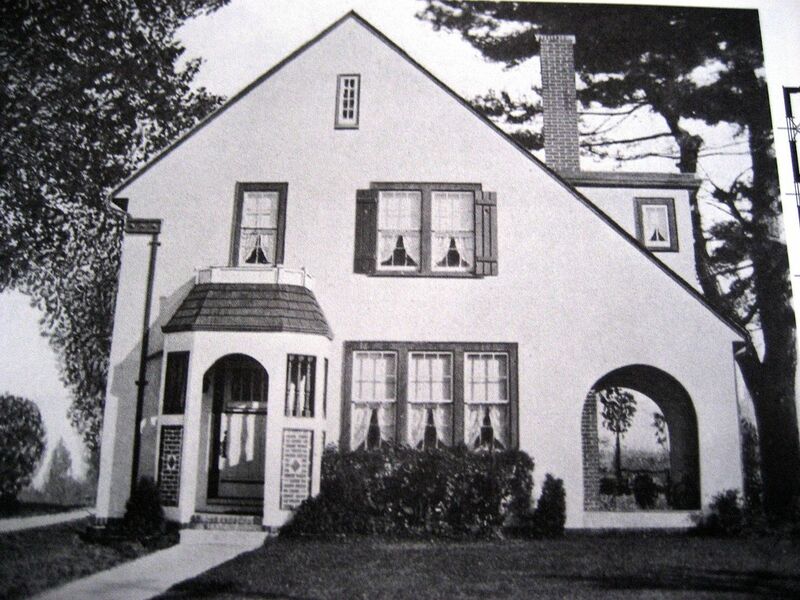 The Attleboro - as shown in 1938. And here it is, in the "flesh." 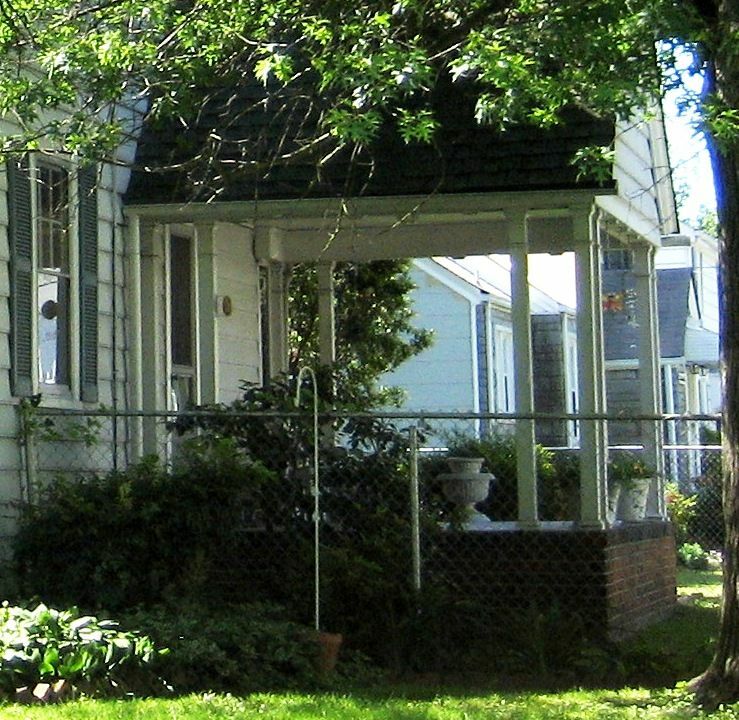 That side porch is offset (as it should be)! 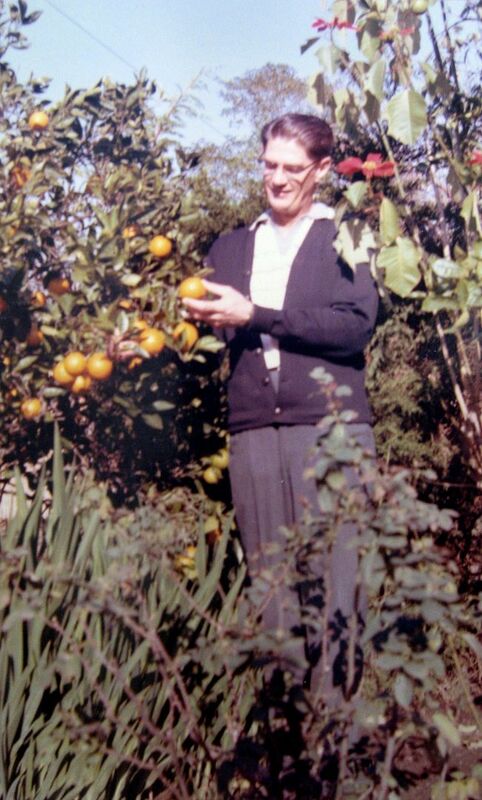 To read about Aunt Addie’s exhumation, click here. 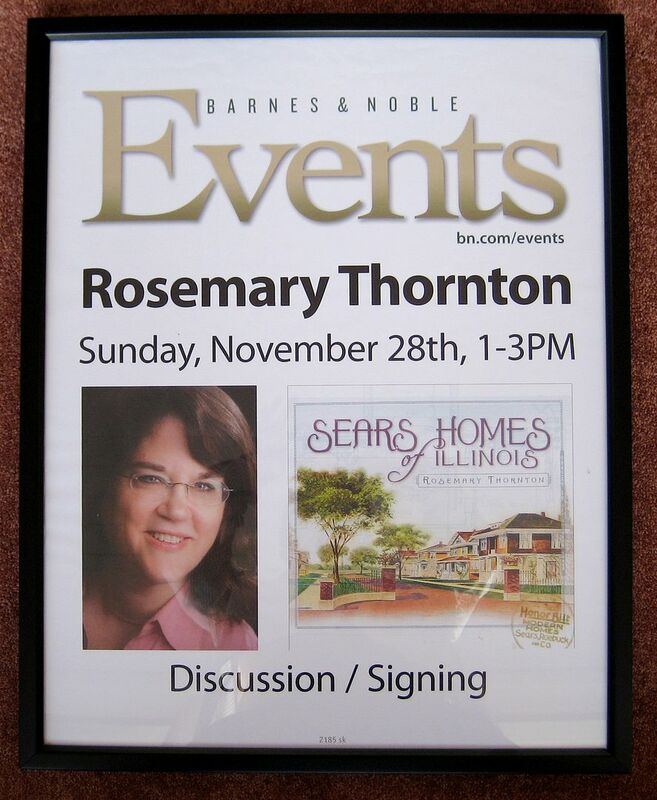 In February 2003, I traveled to Flora, Illinois to give a talk on Sears Homes. 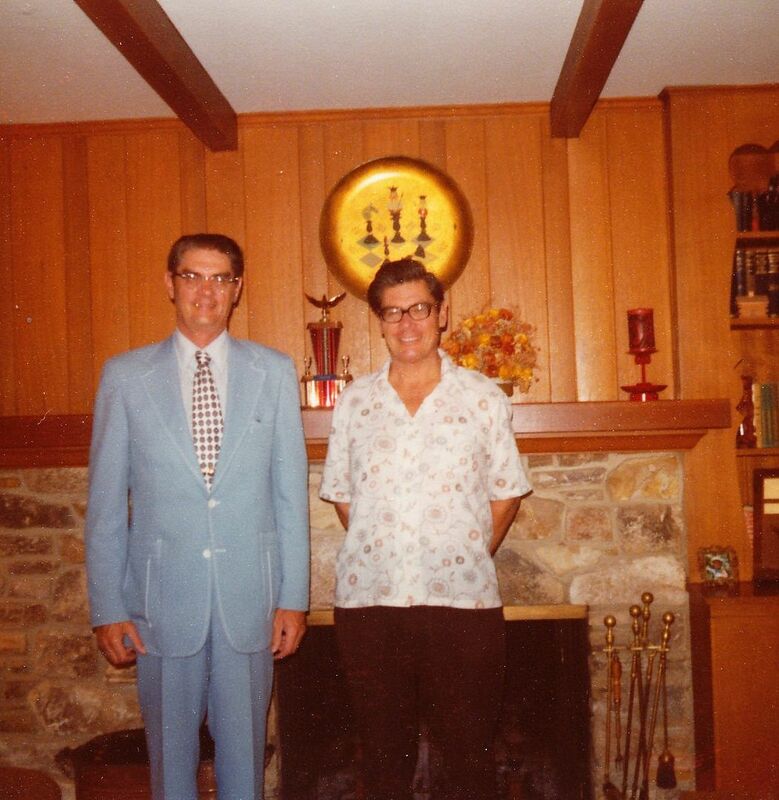 It was one of my first “paid gigs,” and I was very excited about actually getting paid to do the thing I loved the most - talk about Sears Homes! In celebration of this happy time, I treated myself to a fine automobile for the trip. The night before my talk, I went to Enterprise Rent-A-Car and rented a 2003 Cadillac DeVille. My oh my, that was a sweet ride! During the ride around Flora, I found several interesting houses, including the Sears Modern Home #147. 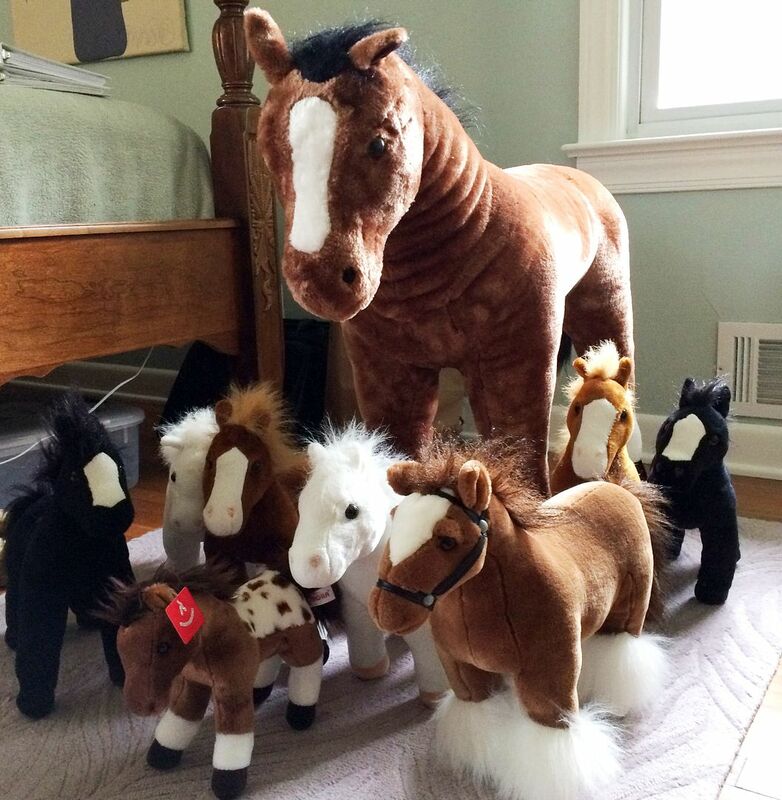 The folks in Flora knew it was a kit house, but they didn’t know which model it was. This was the first time I’d seen a #147, and it was - without any doubt - the nicest #147 that I ever did see. It was in remarkably original condition. He then offered to discount the price of the rental to nothing. “That’ll work,” I told him. Almost ten years later, when I look at these old photos, I remember that fine “Glacier White” Cadillac with its buttery soft “Cashmere Gray” leather seats. Despite our little mishap in Olney, that was one fine automobile. And in the intervening 10 years, I’ve rented at least 20 cars from Enterprise. 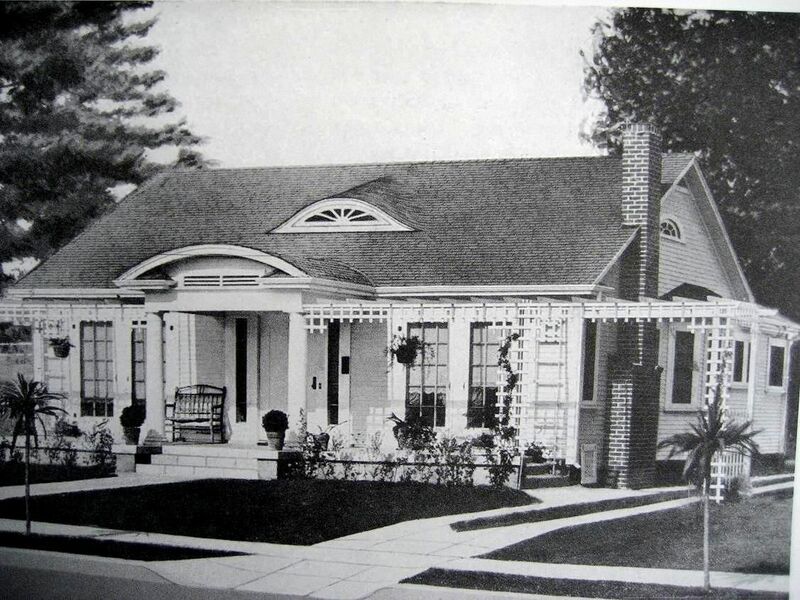 To see more pretty pictures of Sears Homes, click here. 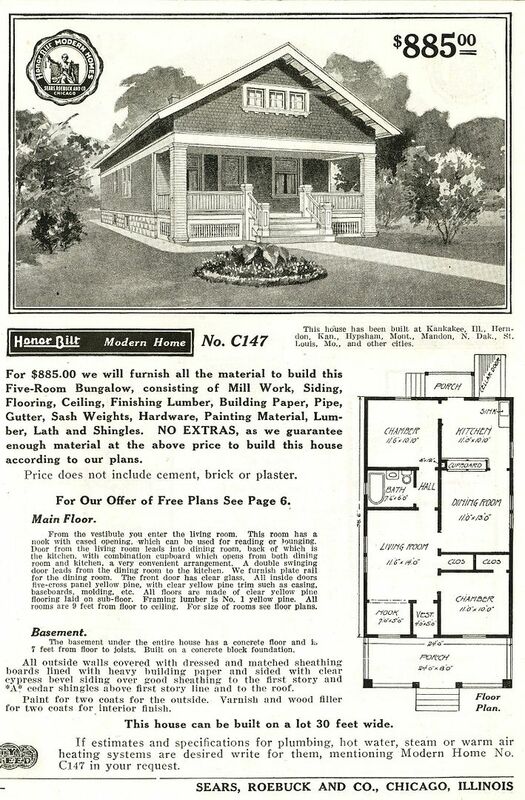 The Sears Modern Home #147 as seen in the 1916 catalog. 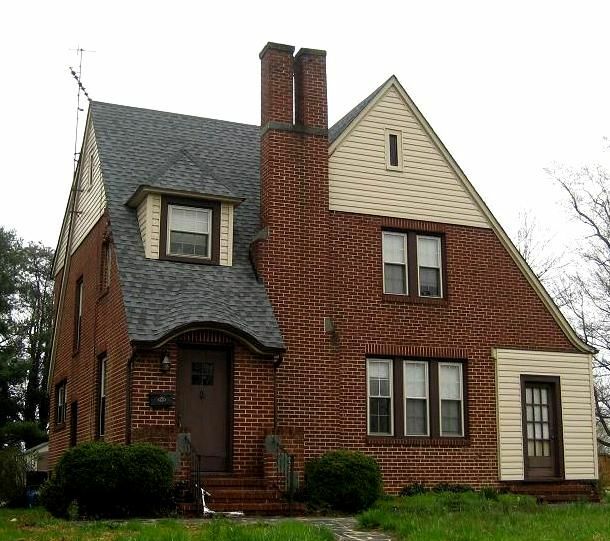 Pretty simple house, but a good value at $885. Look at the columns - clad in clapboard! And here's the world's most perfect $147 in Flora, Illinois (near Olney). The details around the window are perfect! Want to see more pretty pictures? Click here. 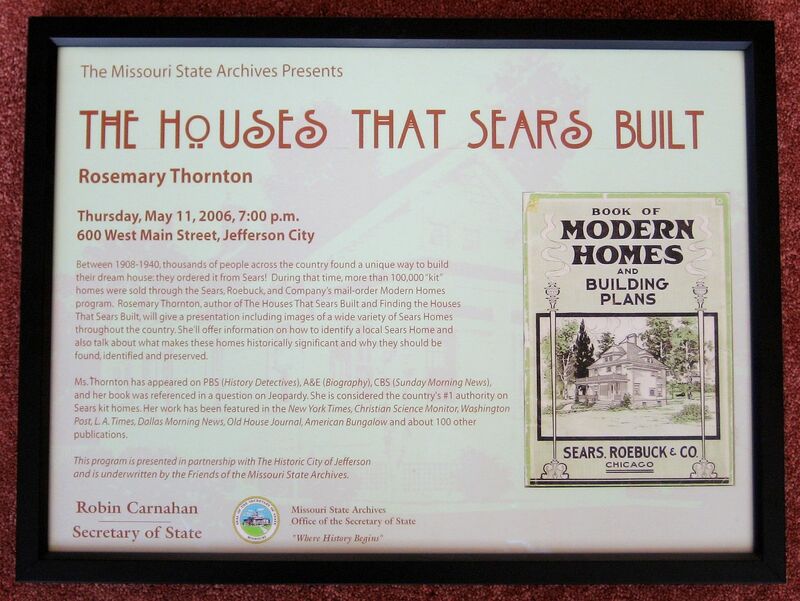 In February 2012, it will have been 10 years since I published my book, The Houses That Sears Built. 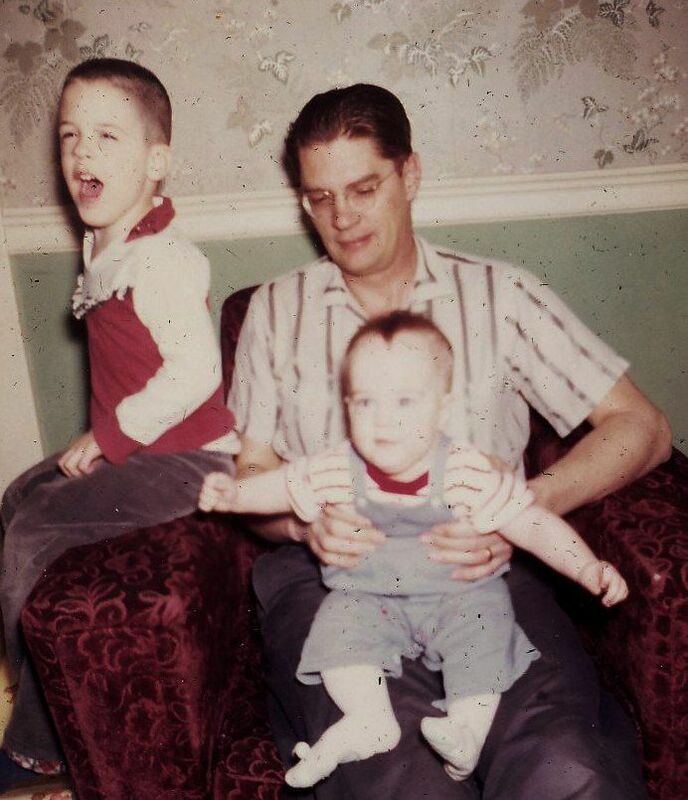 Writing that book was a labor of love, but it was also an incredibly intense experience. By Christmas 2001, I had nearly finished the manuscript. About three weeks before the holidays, I decided to cancel my plans and stay home and finish up the manuscript. I was on a roll, and after two years, it was time to put my nose to the grindstone and get it done. But one of those “little voices” told me that this was an important trip, and that I needed to stick with the plan and spend Christmas in Portsmouth. On Christmas Eve, we had dinner with my mother. We were so happy to see her, and spend time with her. And I had a surprise. I’d just had a big article published in a national magazine. She was so proud of me, and asked me to read the article out loud to her, which I did. My dear mother looked at me and just beamed. And at that moment, I almost slipped and told her my secret: My new book was going to be dedicated to her, Betty B. Fuller. The inscription would read, All that I am or hope to be, I owe to my angel mother. 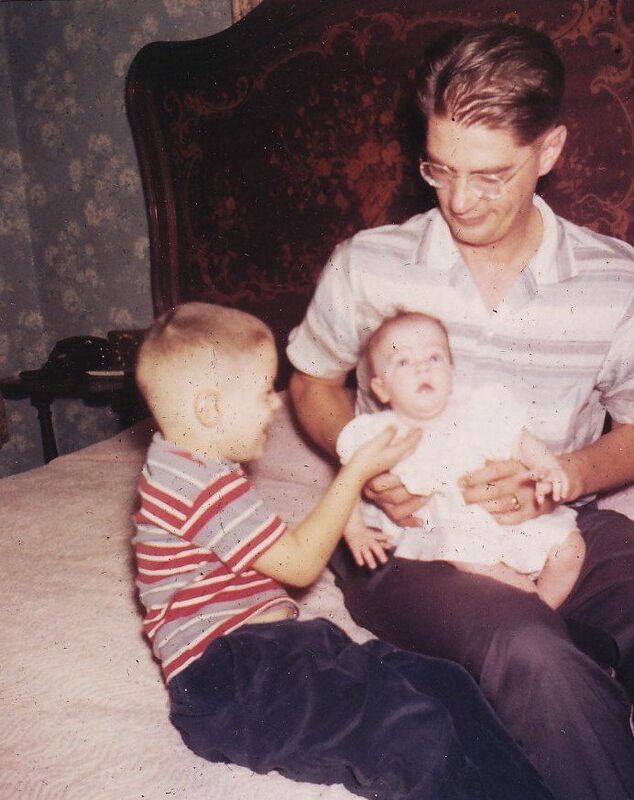 I remember my mother’s prayers and they have always clung to me. It was a quote from Abraham Lincoln and it described exactly how I felt. 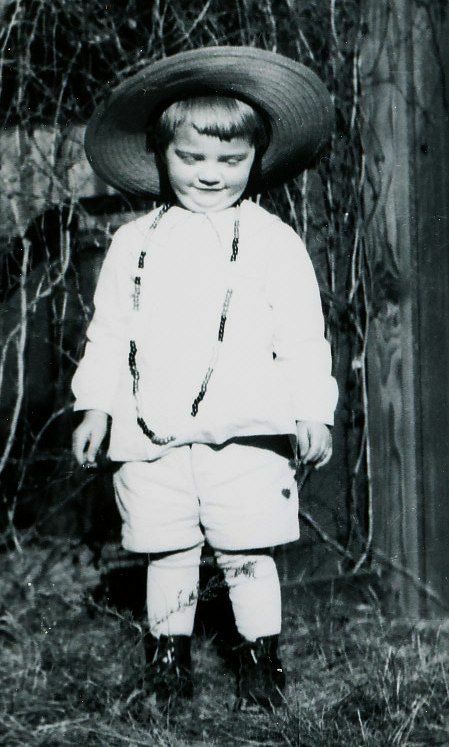 Throughout my life, my mother’s prayers had been such a blessing and support. She was always my #1 cheerleader and my dearest friend. The next morning, she didn’t answer the door and she didn’t answer the phone. I used my key to get into the house and that’s when we found her - still in bed - ashen and barely breathing. She never regained consciousness, and died a short time later. Twelve days later, I returned home, hardly able to think about that book of mine. Suddenly, it seemed so completely unimportant. However, I eventually pulled myself together enough to finish it and take the manuscript to the printer. That was February 2002. Later that month, my husband of 24 years told me that he now understood Paul in the Bible, and that like Paul, he realized he was not the marrying kind. He asked for a divorce. And so ended a relationship that had begun in 1968. I’d met Tom when I was in third grade. I moved out of the family home, and into a low-rent singles’ apartment and tried desperately to start a new life. 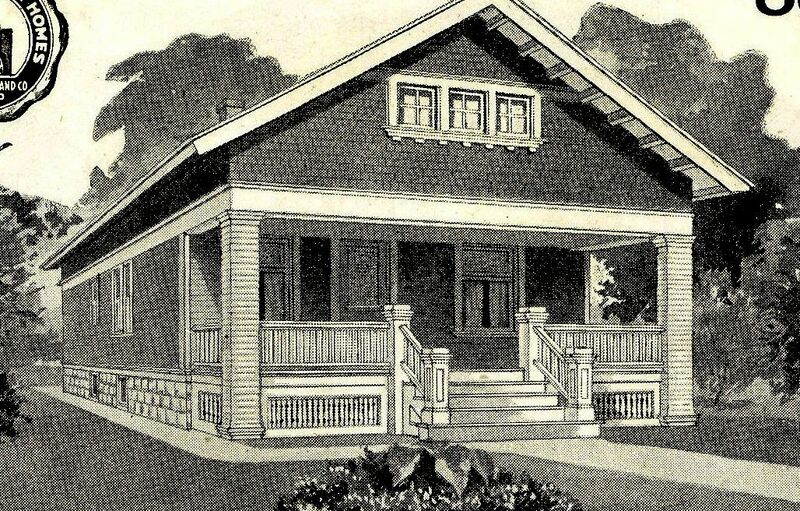 The Houses That Sears Built - was more than just a book. It became my raison d’être, literally. The book - and the career that came with it - gave me a sense of purpose and pride and unspeakable joy. Less than 60 days after its publication, I was interviewed for a feature article in the New York Times. That was a wonderful break. 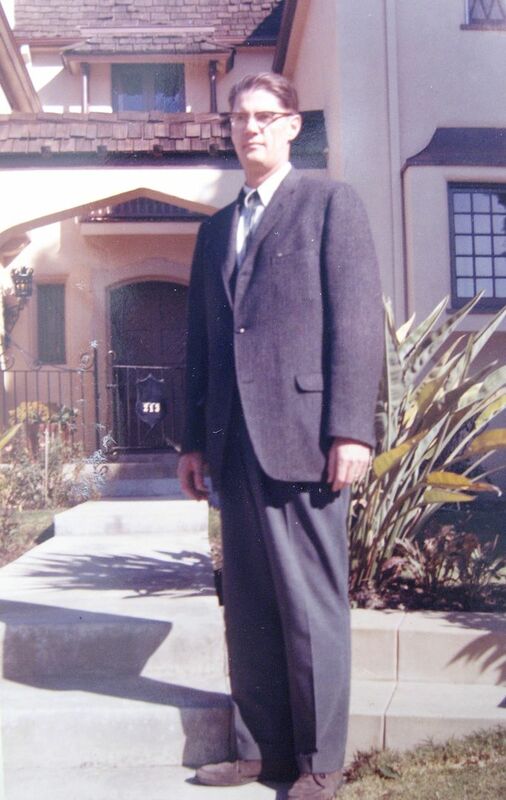 Next, I was invited to appear in a new show being developed for PBS, tentatively titled, The History Detectives. From there, I ended up on A&E’s Biography, CBS Sunday Morning News and more. In July 2004, my book made it to Jeopardy! By Summer 2006, I’d done more than 500 interviews and had appeared in almost every national newspaper in America, including, Christian Science Monitor, Dallas Morning News, Los Angeles Times, and the Washington Post. In June 2006, my story appeared in the Wall Street Journal - front page - and above the fold! That was the coup of my career. And in Summer 2006, I met Wayne Ringer. Six months later, we were married. I’ve always believed in God’s timing, and the timing of this book’s publication and the start of my new life could not have possibly been any better. And it was FUN. I traveled all over the country and was a featured speaker at countless venues and seminars and preservation conferences and I was treated like a queen. I really liked being treated like a queen! The book - and the career that followed - restored my soul and healed my shattered self-esteem. Divorce is tough. It was (and still is) one of the best memories of my career. 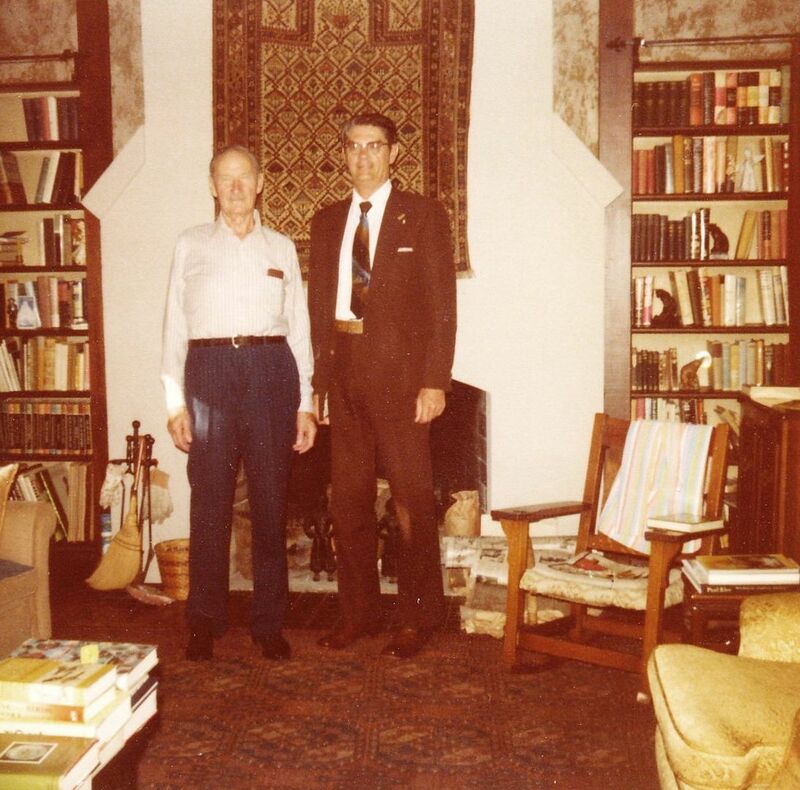 And it all started with one little self-published tome on Sears Kit Homes. Ten years ago, this month. Only 3,000 copies of this "first edition" were sold, and by then, I'd written an updated version, which has been in print since February 2004. The first edition (now out of print) fetches a handsome price. 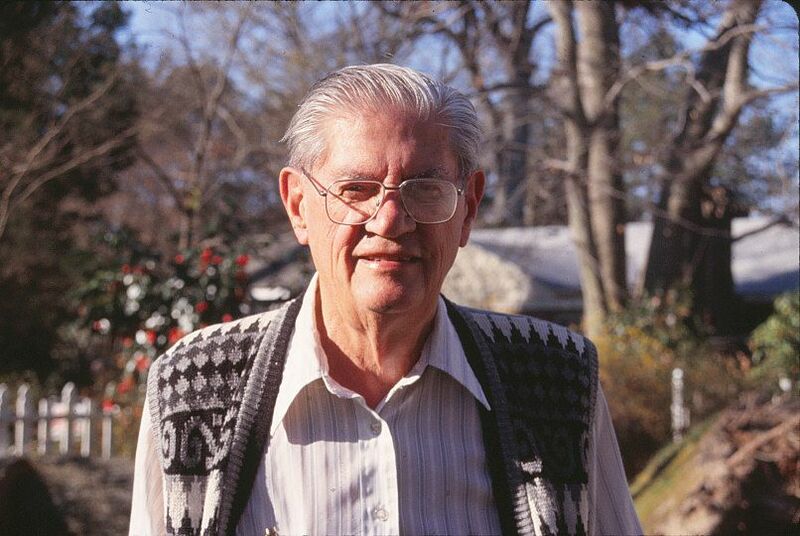 In May 2006, I gave a talk in Jefferson City, Missouri. 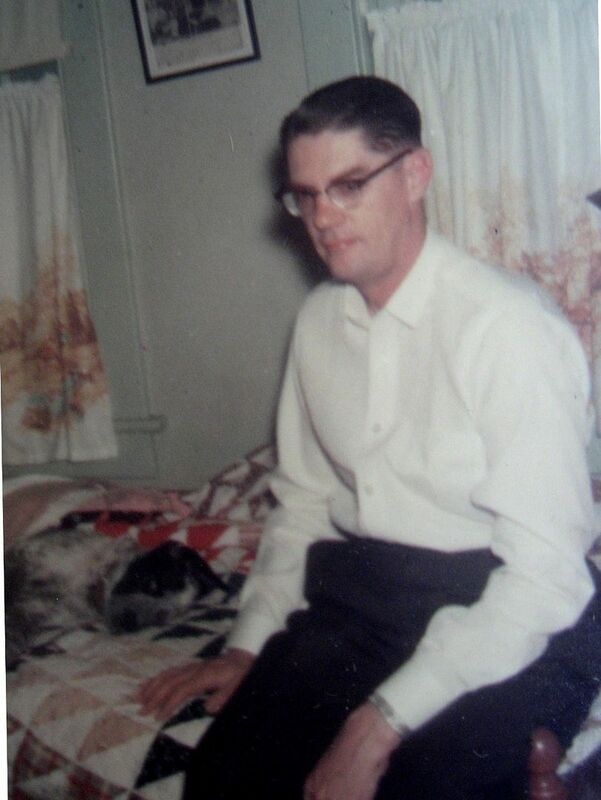 While in Jefferson City, I had my first telephone conversation with Wayne, the man who'd become my husband. In 2010, "The History Press" contacted me and asked if I'd be interested in writing a coffee-table book on Sears Homes. 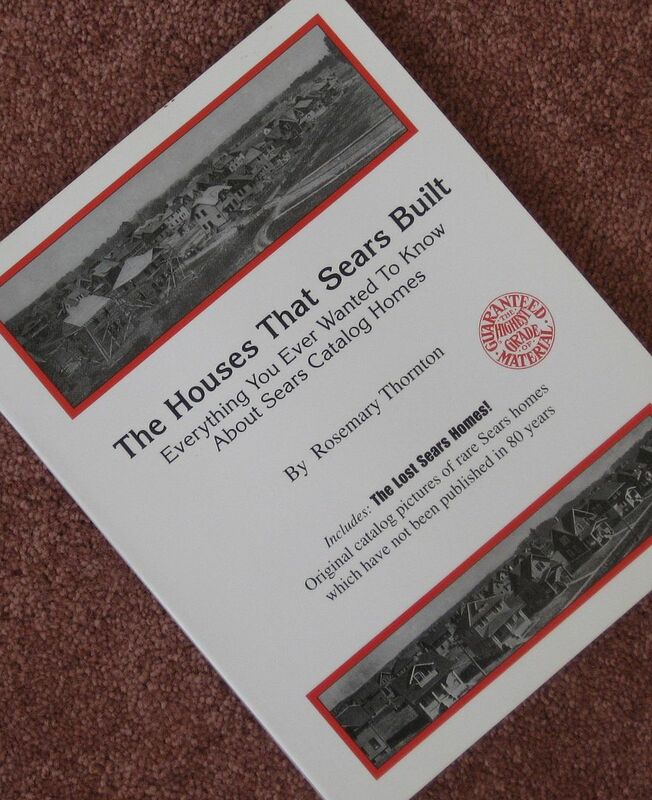 "The Sears Homes of Illinois" was the result, and this was - without any doubts - my last book on kit homes. 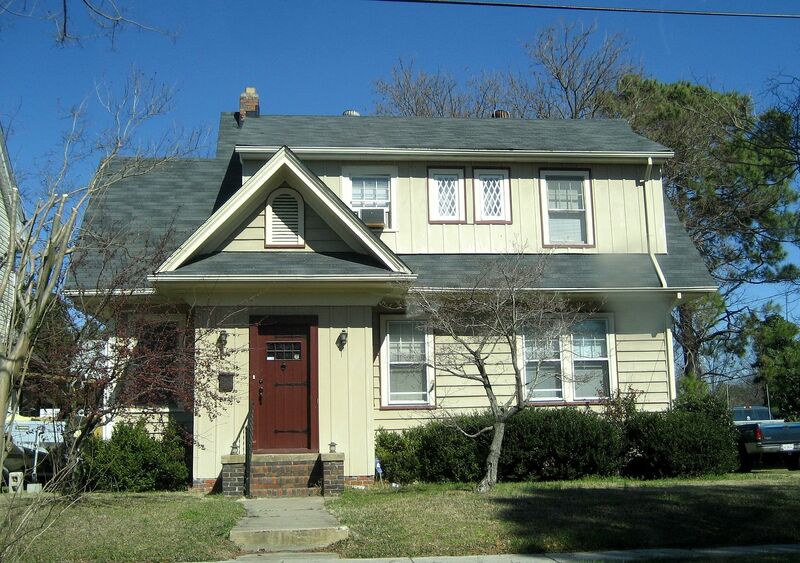 To see the kit homes of Norfolk, click here. 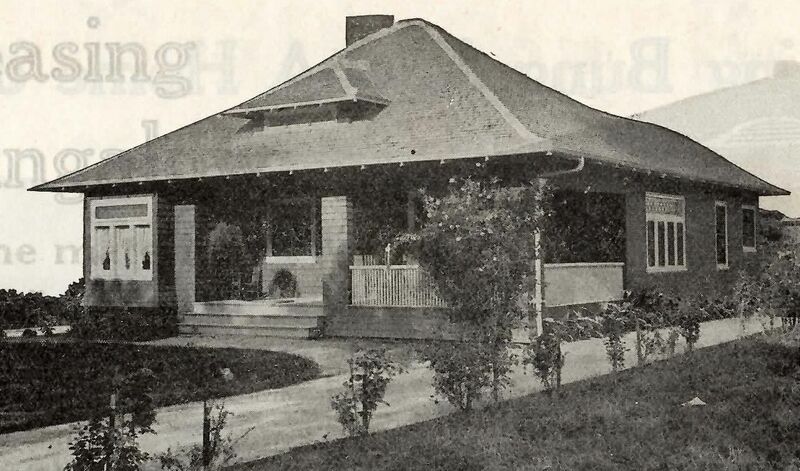 Tens of thousands of homeowners turned to Plan Books for their housing needs in the early 1900s. It was similar to buying a kit home, but with a few important differences. After browsing the pages of a plan book (filled with pretty pictures of pretty homes), you’d pick a house that fit your budget and your needs, and then send off a few dollars. Within a few days or weeks, you’d receive a full set of blue prints, plus a list of the building materials you’d need to build your dream home. In other words, you were buying blue prints and a building materials list, nothing more. 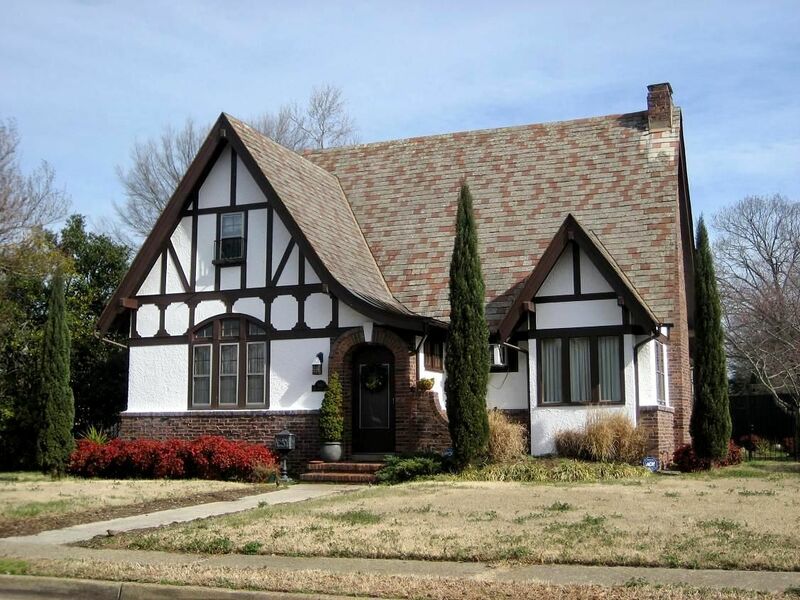 Plan book houses are so ubiquitous and the designs are so varied that a person could drive themselves nuts trying to find and identify all the plan book houses in their neighborhood. 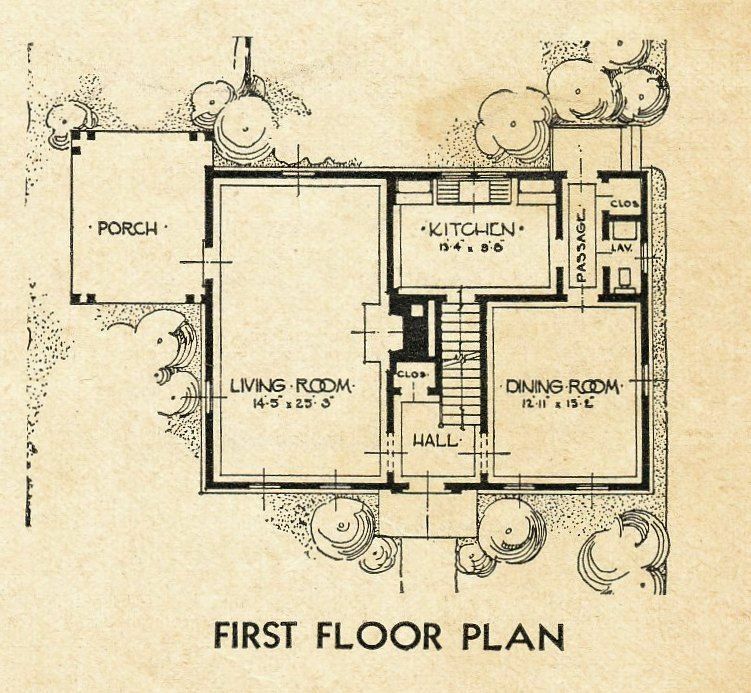 I’ve got one book of plans from the late 1920s, and it must have more than 500 house designs. And that was one company. 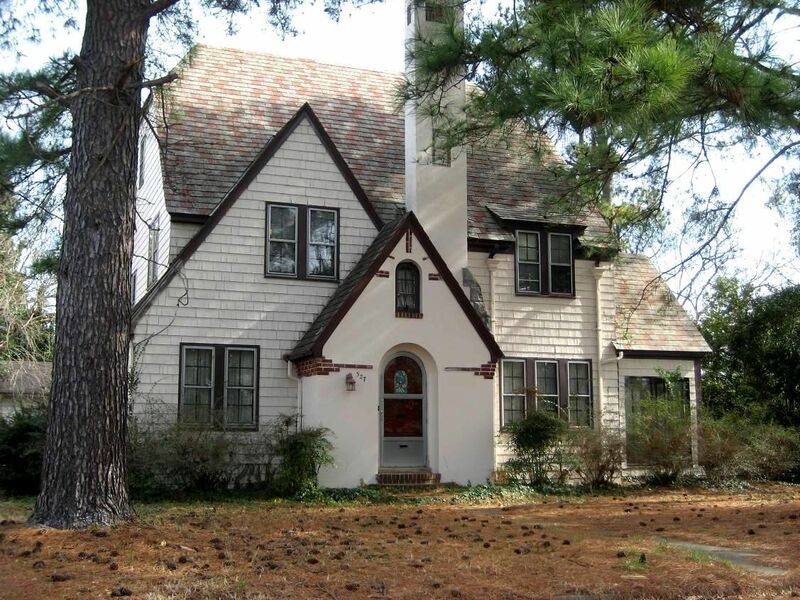 That being said, I did go through a “plan book phase” in my house hunting career, and here are a few of the houses I found in Portsmouth (and surrounding areas). 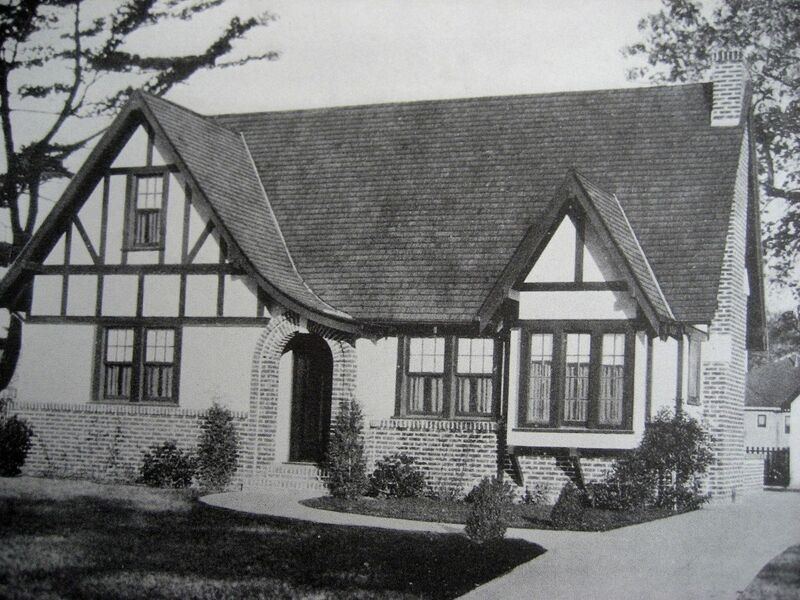 Nice little Tudor from the pages of a popular early 1920s planbook. 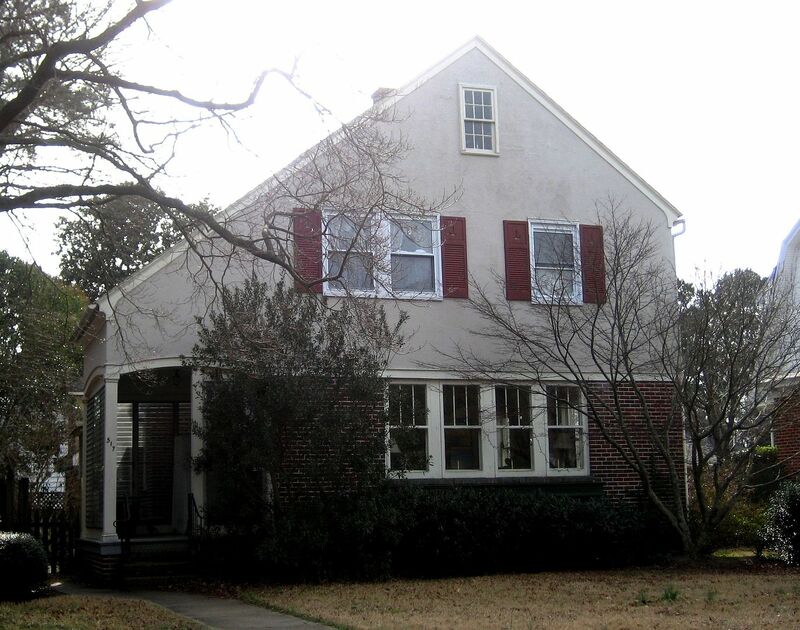 Nice match in Portsmouth, Virginia on Rockbridge Road (Waterview section). 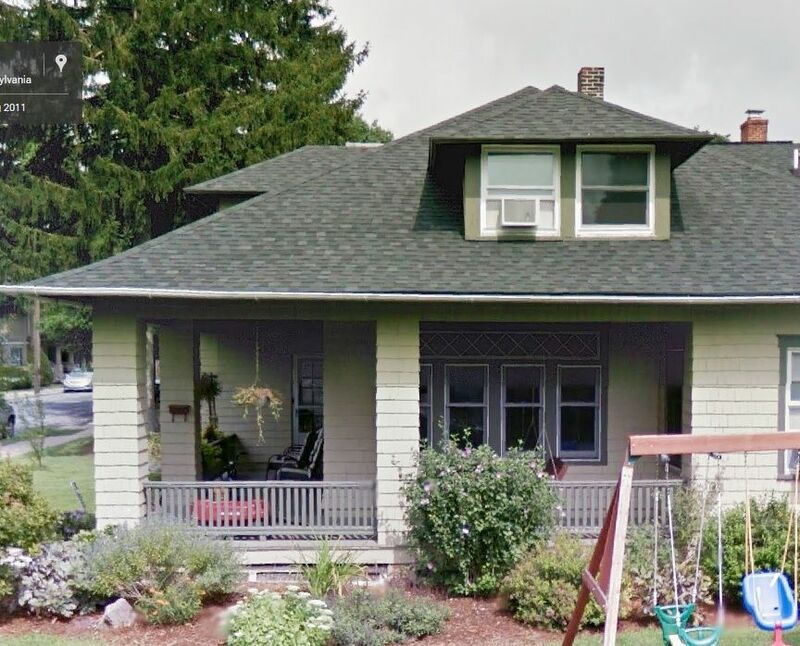 Kind of a funky looking house with that arched porch roof. Also on Rockbridge Road (Waterview), this house had some big dormers added. This is one of my favorites. 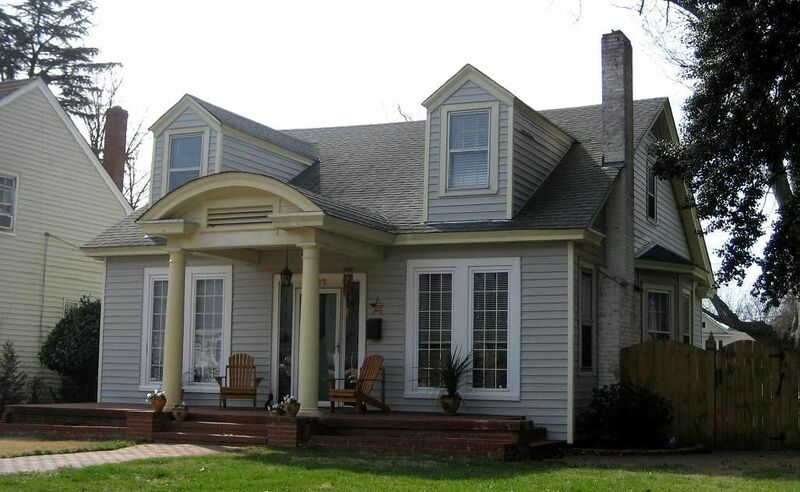 Nice design and good front porch (on the side). Poor photo, but great house. I grew up next door to this house. 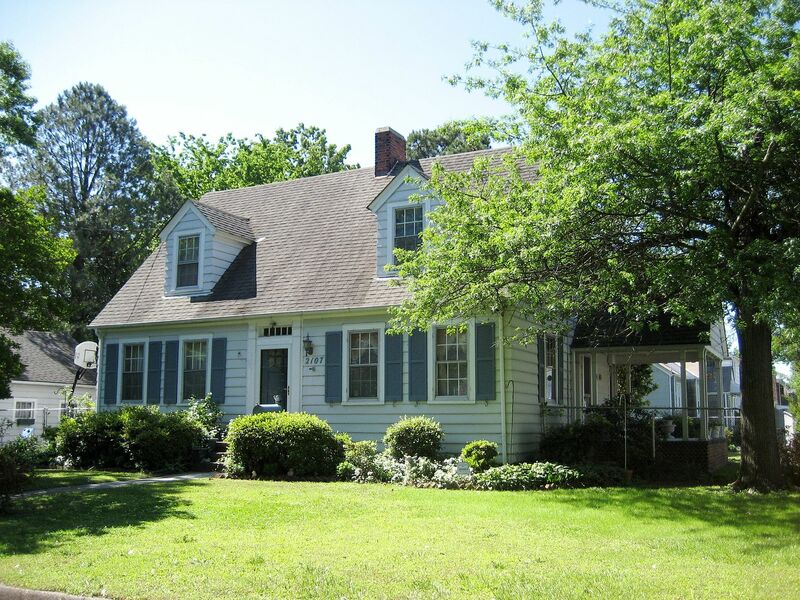 My home was at 515 Nansemond Street, also in Waterview. This is my favorite match! 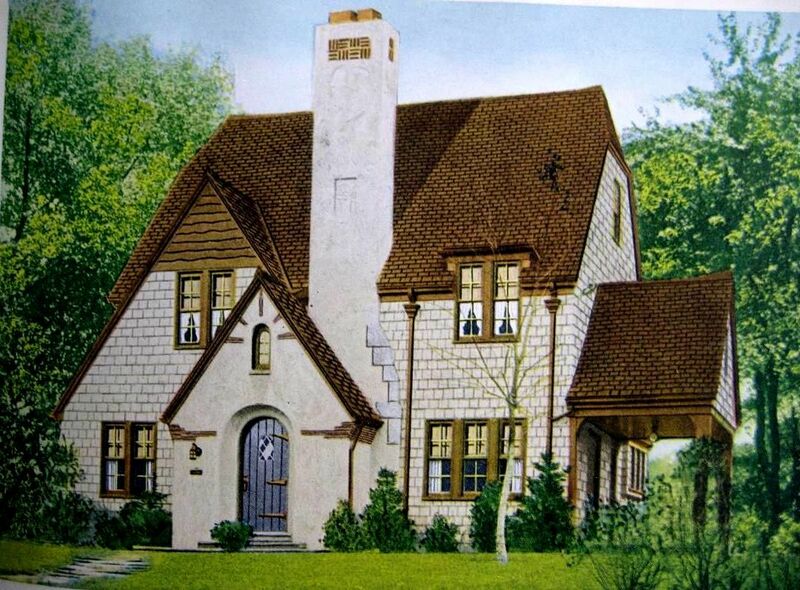 The house is a perfect match to the catalog image, and it's even painted in the same colors! I sent these folks a color copy of this catalog page, but never heard back from them. This house is on Riverside Drive (Waterview). Even the tiny little details are a spot-on match. 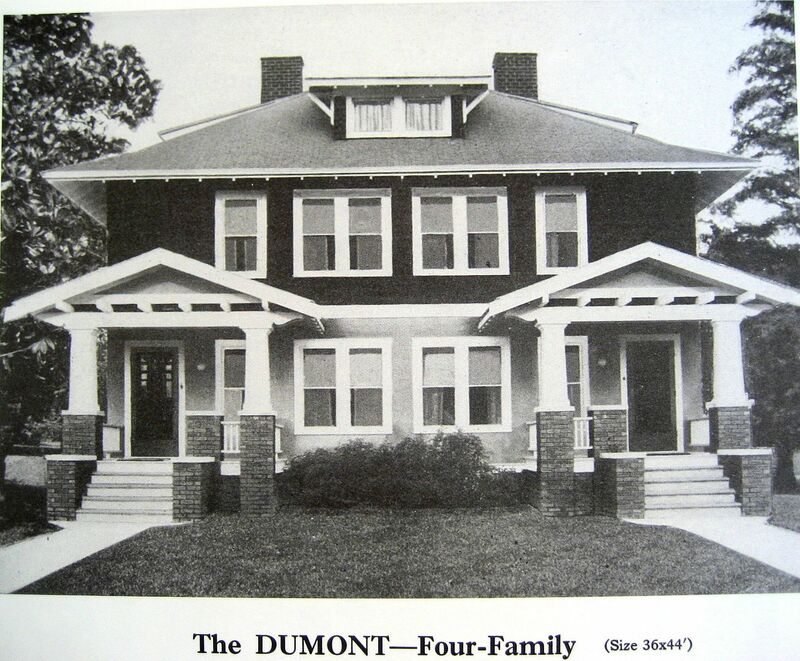 This was a four-unit apartment, and proved to be a popular design. I've seen three of these in my travels. This one is in South Norfolk (near Portsmouth). 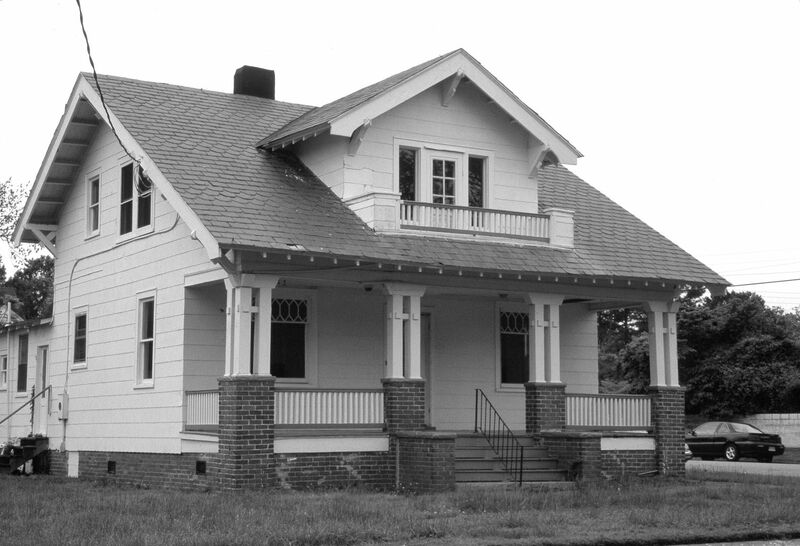 The details around the front porch gable are a tiny bit different, but the rest of the house is a perfect match, down to the strap hinges on the front door. This house is in Park View (Portsmouth). 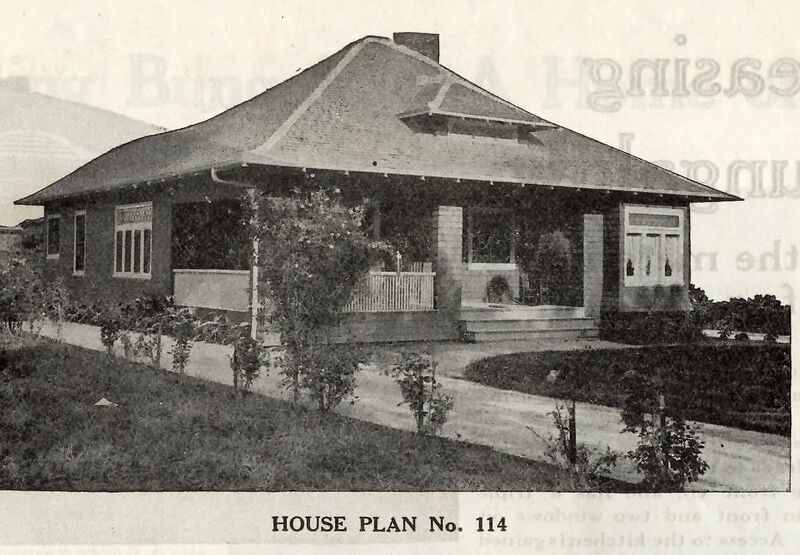 The Regent was also a popular plan book house. 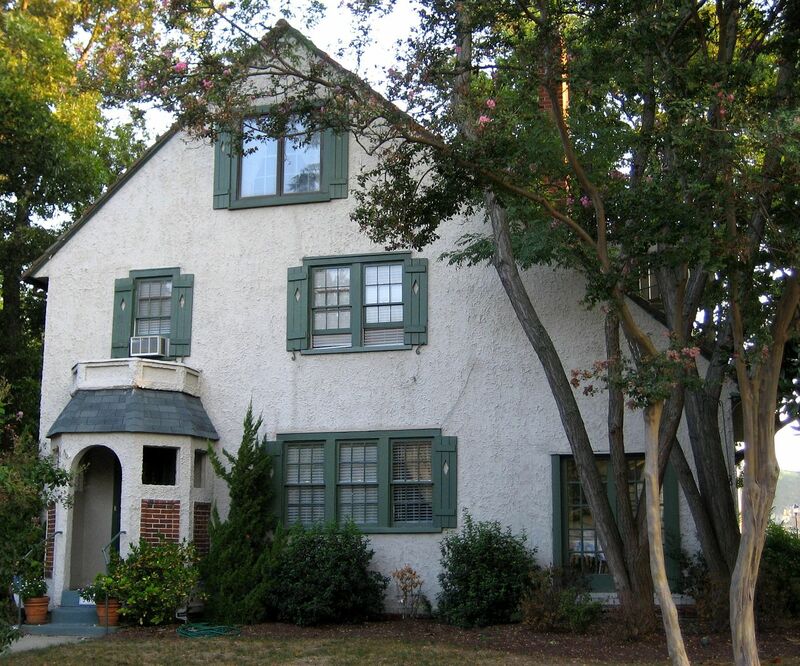 And this one is in the Colonial Place neighborhood in Norfolk! 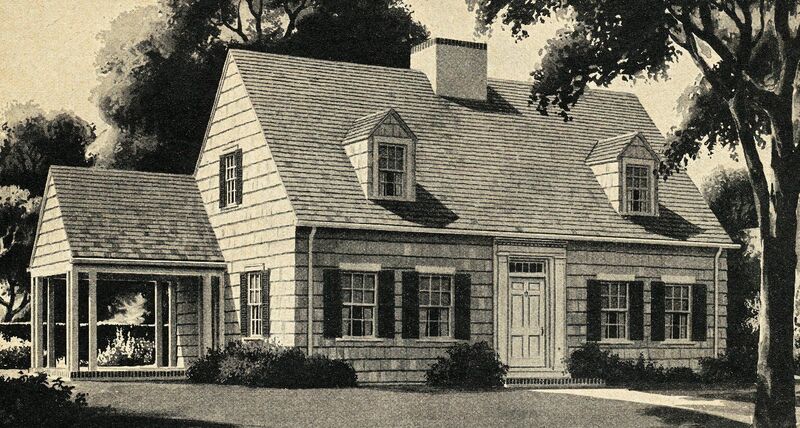 This last house is not in Portsmouth, but it is probably *THE* most popular plan book house I've come across. I found two of these in Beckley, WV and I've seen countless others all over the country.